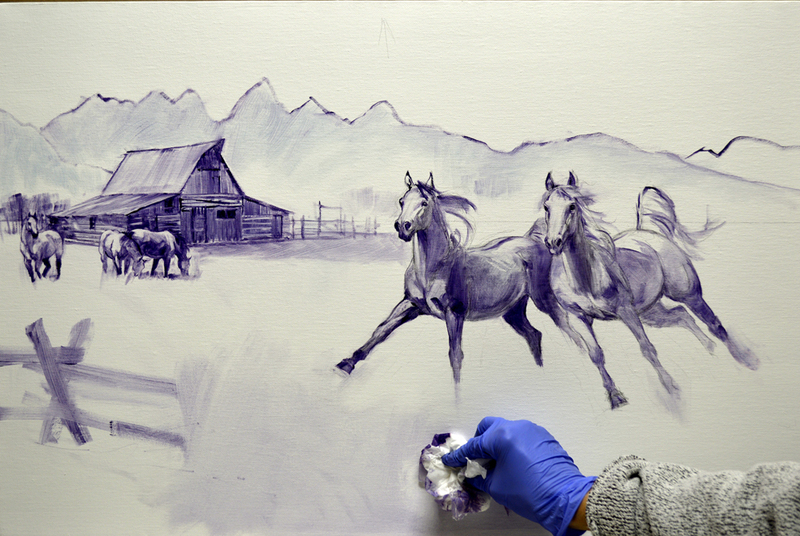 We’re traveling to Wyoming for our next painting! 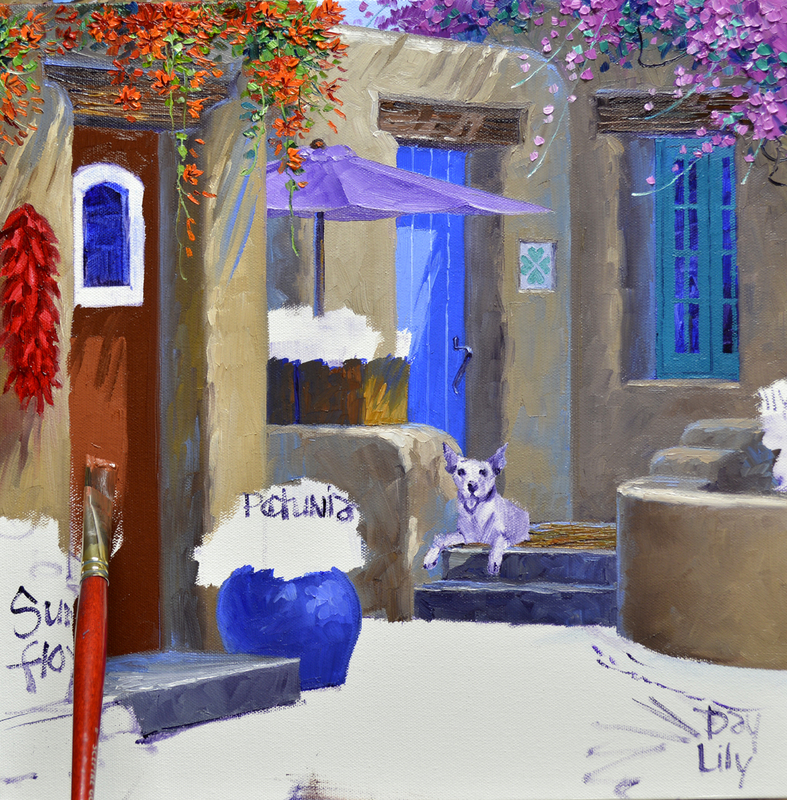 My collector visited there and asked me to capture their memories on canvas. 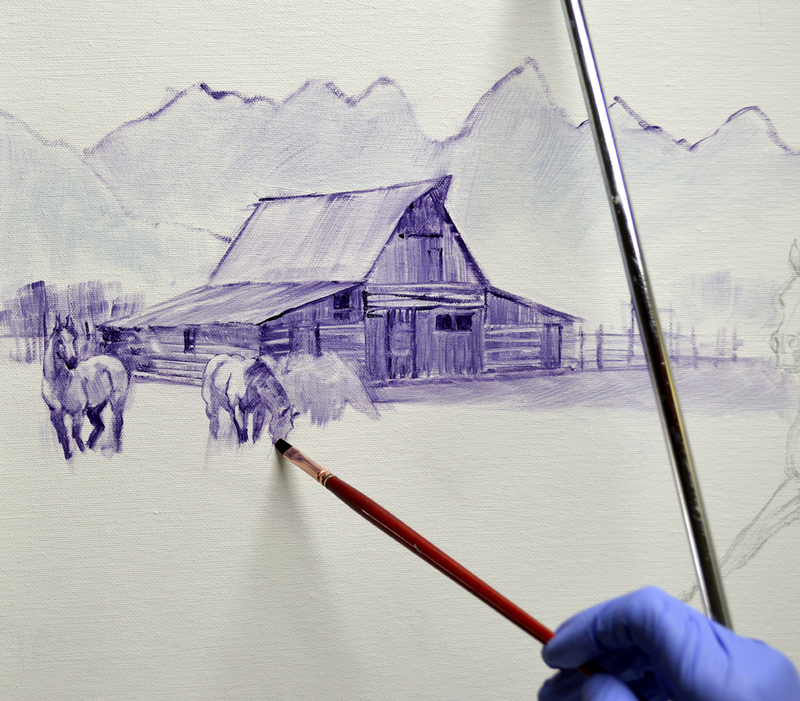 The famous TA Moulton barn, with the distinctive mountain line of the Tetons in the background, will be featured. He’s an amazing photographer and provided me with wonderful images to work from. 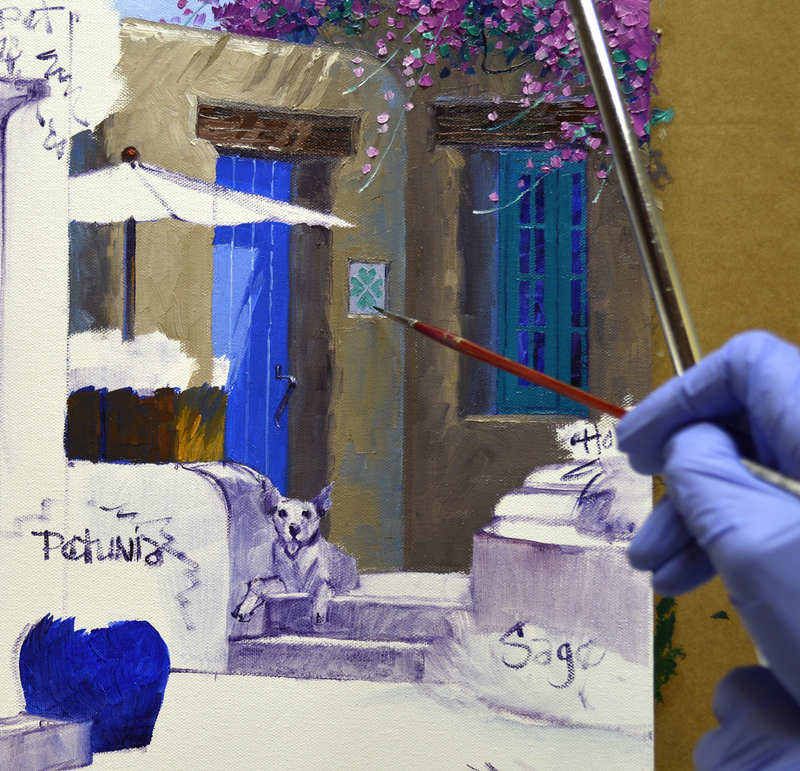 A small sketch is done to establish the arrangement of the major elements on the painting. What would a painting of the West be without horses? 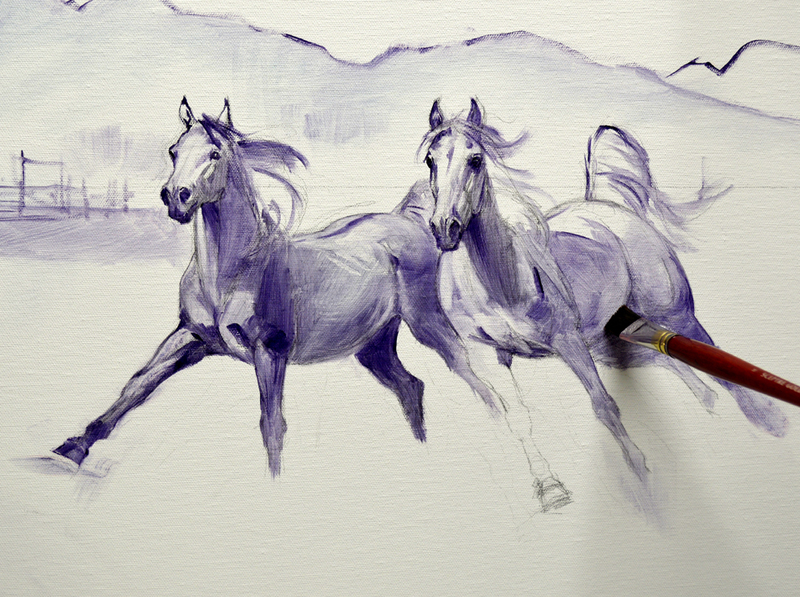 To sketch the composition on the canvas I begin with the pair that is running. Since they are in the foreground I want to get them drawn first. 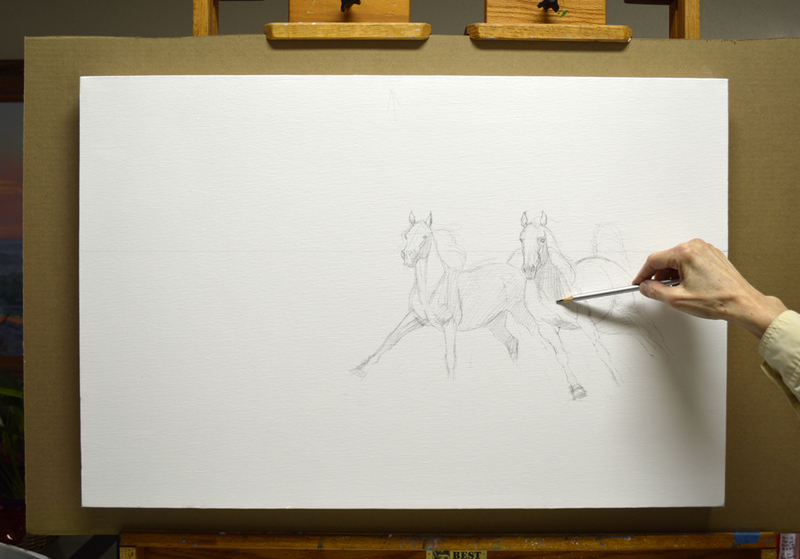 The placement of the other horses and the barn on the canvas will be determined after the pencil sketch of these two is complete. 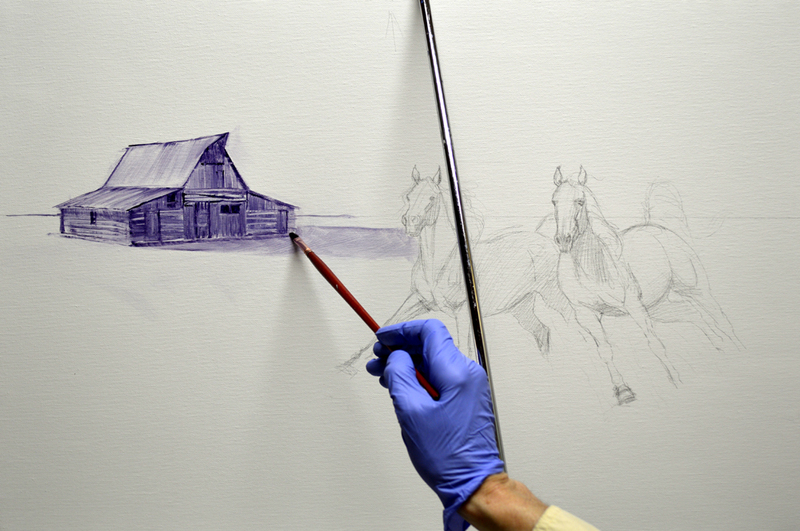 Next I draw the barn with a brush dipped in a very thin oil wash made of MUD (Ultramarine Blue + Alizarin Crimson) + Liquin. My wrist rests on the mahl stick to steady my hand. 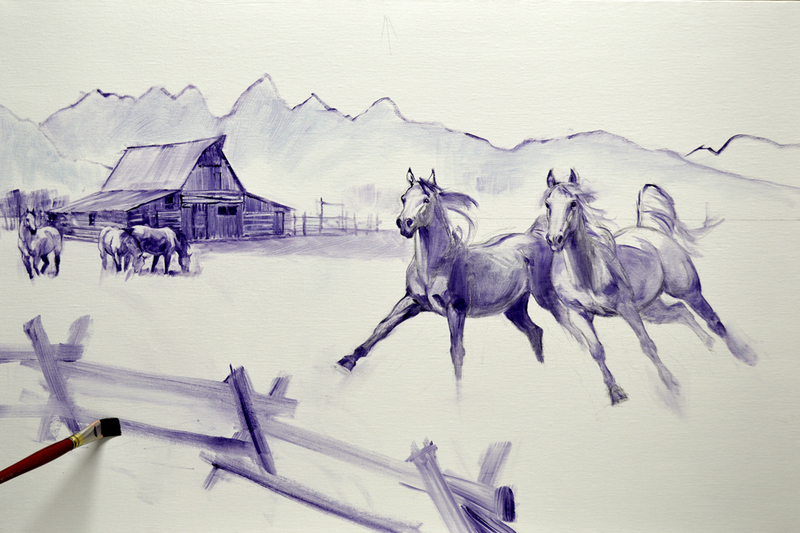 Now the other horses in the meadow are added. I’ve been asked if I “Make Up” my horses or do I use photos? 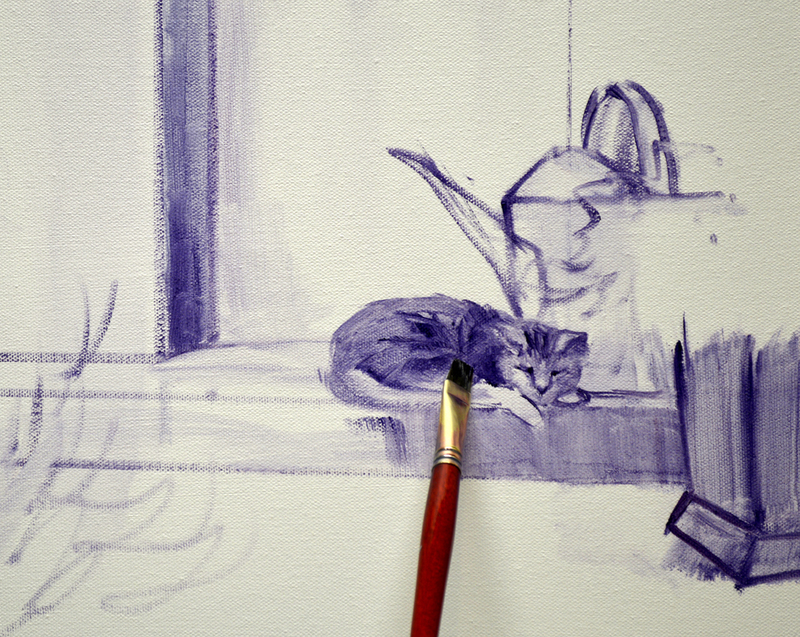 I use reference materials for almost everything I paint. I’ll combine lots of different pictures to compose a scene but rarely do I make anything up. Over the years Jack and I have accumulated thousands of images we use for reference. There is nothing as beautiful as a horse running freely with mane and tail flowing in the wind. These two appear to be racing for pure joy! That’s easy to fix. 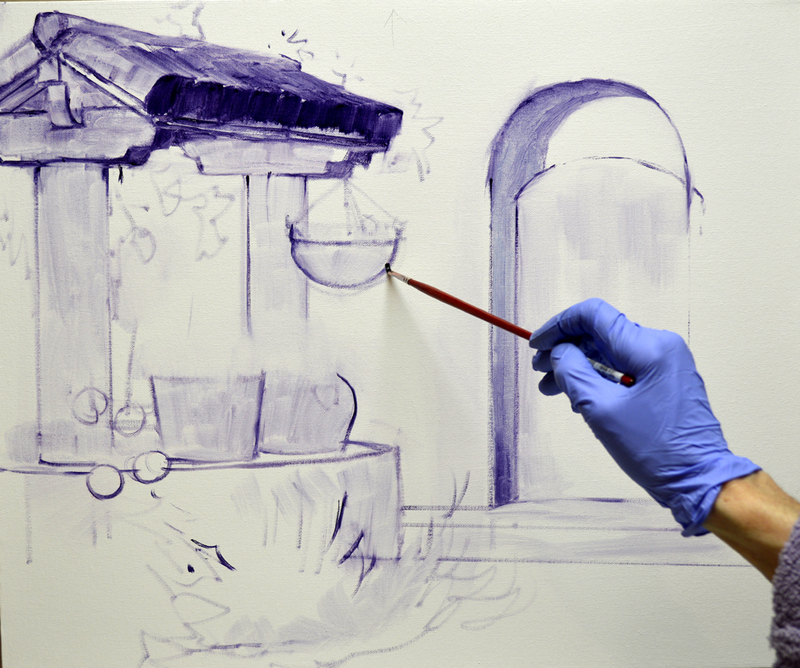 We purchase double primed canvases, then I apply another thin coat of Acrylic on top of that. This makes the surface slightly slick, it’s easy to erase my oil wash drawing with a clump of toilet tissue dipped in Turpenoid thinner. 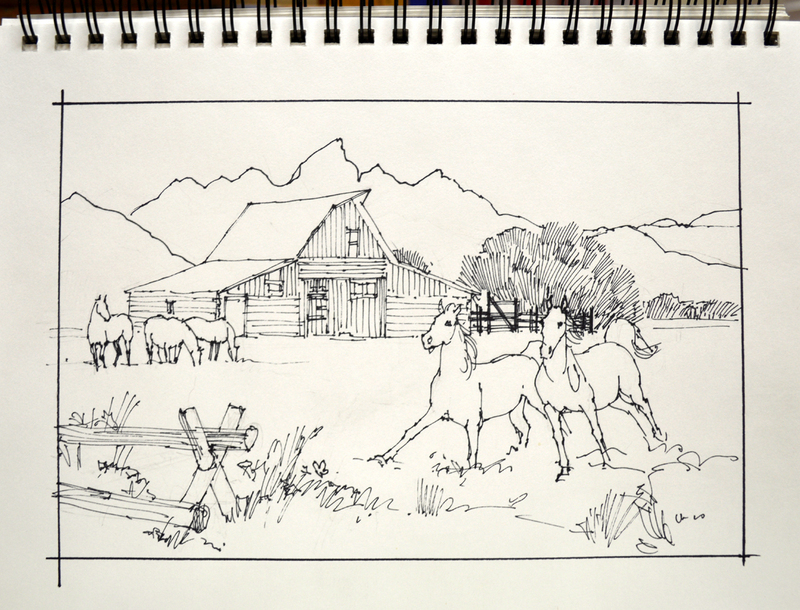 To anchor the foreground I add a small brook, this way the horses can be wild, crazy and FREE! Much more open and inviting, don’t you think? If you would like to receive an email every time I publish a new post please feel free to subscribe to my blog. CLICK THIS LINK and scroll to the upper right side of the page. You will see a heading EMAIL SUBSCRIPTIONS. Just enter your email address and click the button “Sign me up!” It’s easy. And if you enjoy my blog please CLICK the FaceBook LIKE Button. As we say in Texas, “Much Obliged! Now for that little fella snoozing away on the sun warmed step. For the browns in his tiger coat I’ve used paint left over from the beams on the old well. 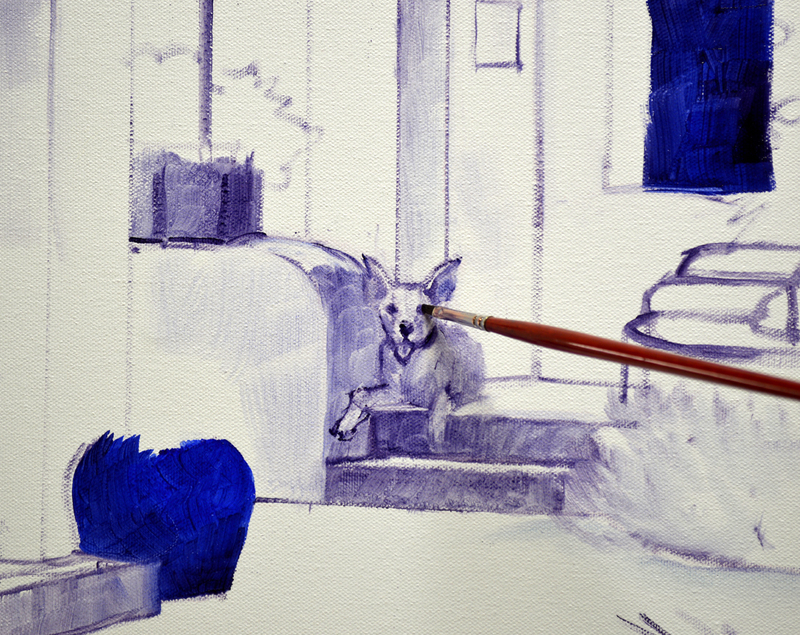 His dark stripes are delineated with a brush dipped in a mix of MUD (Ultramarine Blue + Alizarin Crimson) + Liquin. Geraniums! 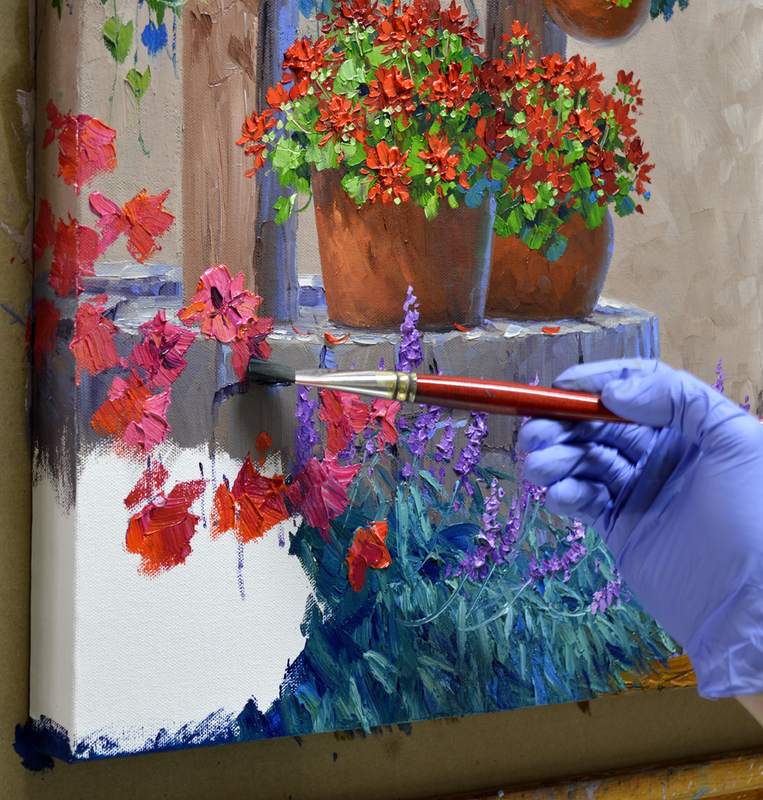 All three steps of my Flowers First, Leaves Last painting process are shown here. 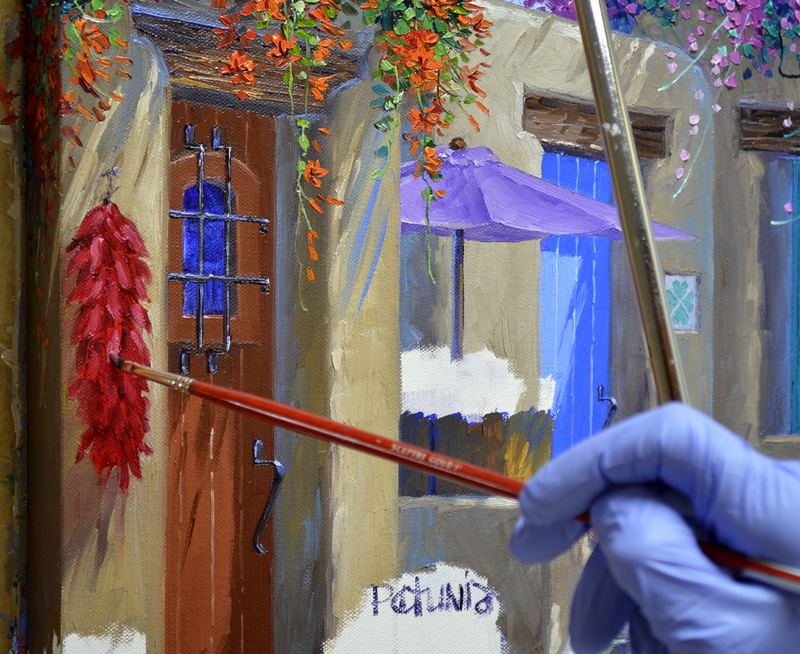 Flowers are first blocked in with masses of Cadmium Red Deep and Cadmium Red Medium in the container to the left of my brush. 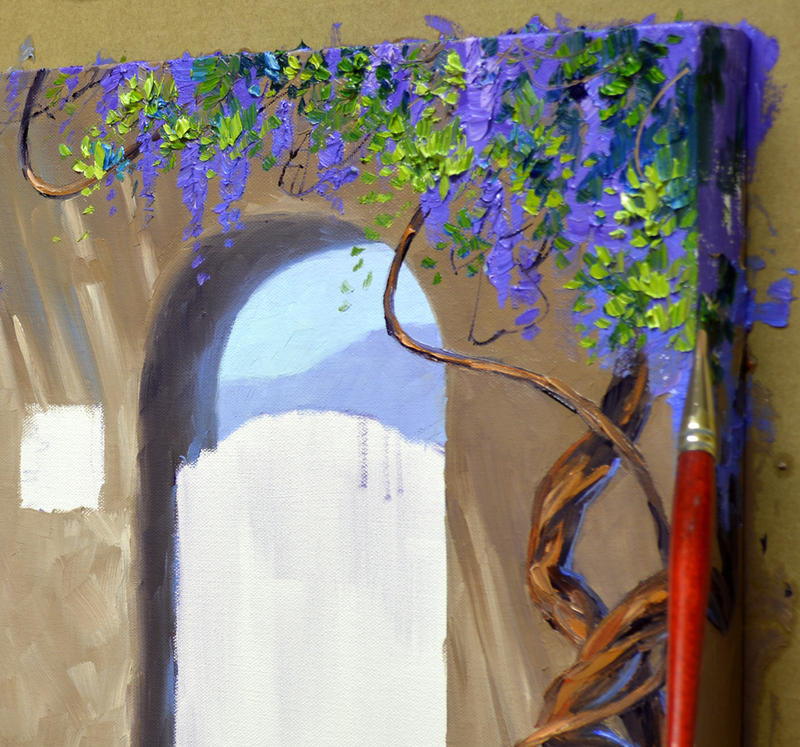 I’m working on the second step, adding green leaves made of Pthalo Blue + Lemon Yellow. 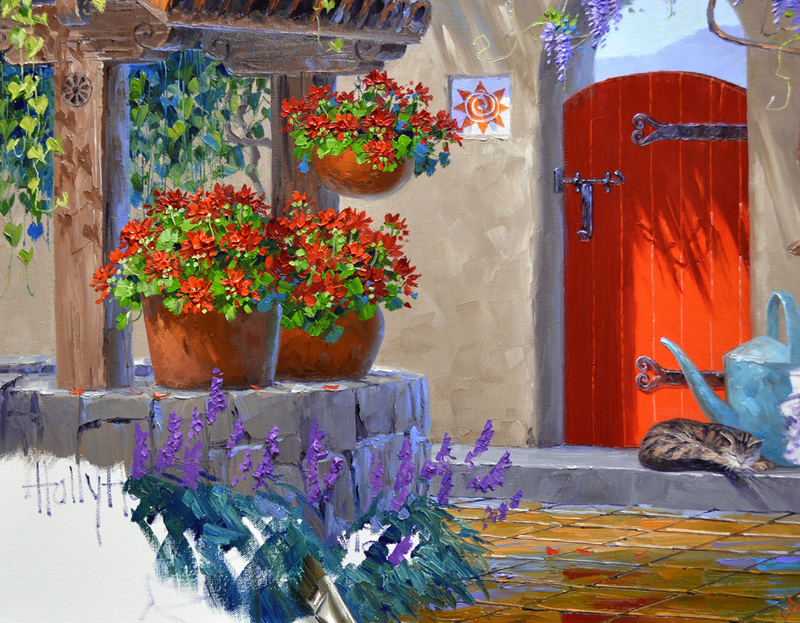 The Geraniums in the hanging basket are complete with flowers highlighted in Cadmium Red Light, light green stems and flower buds. To see this image larger just click on the picture. 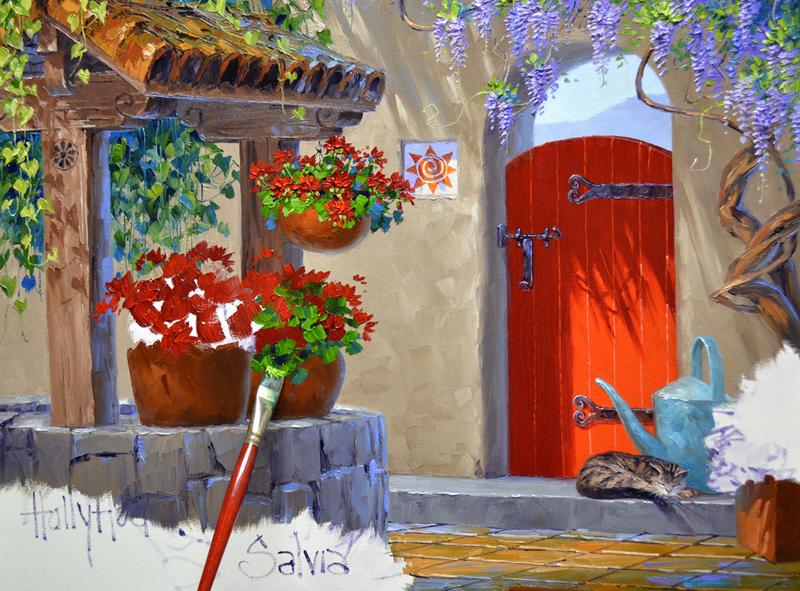 Salvia grows around the stone base of the well. 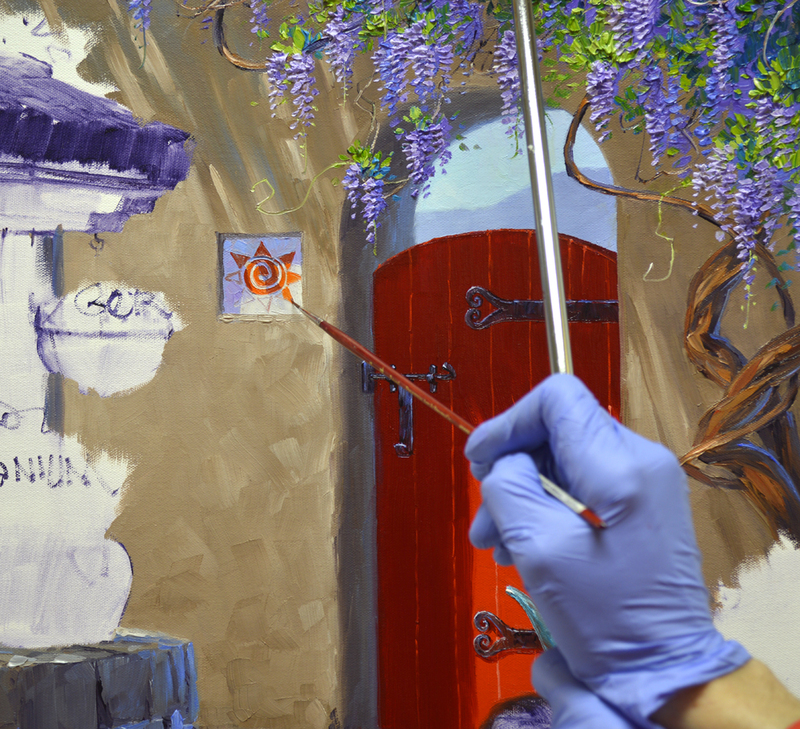 The spiky flowers are Magenta + Dioxazine Purple + White while the foliage is made with combinations of Pthalo Blue + Cadmium Orange + White. Rose of Sharon resides happily by the Salvia. The flowers are very similar to those of the Hollyhock, it just doesn’t have the tall stalks covered with seed pods. 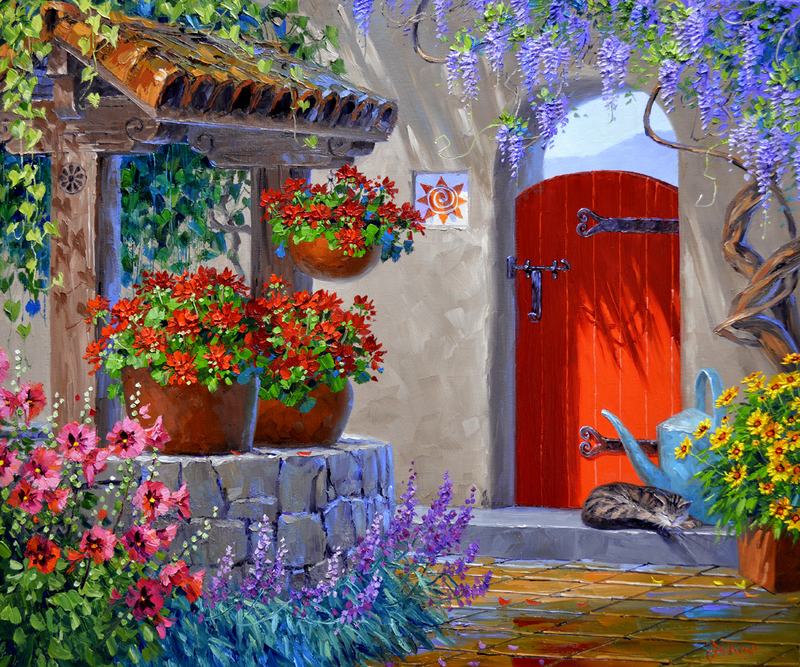 Originally I’d planned to plant Hollies here but realized those distinctive stalks would cover over the heart shaped leaves of the vine draping from the roof of the well. We’ll let some Coreopsis grow in the container by our kitty and the watering can. The flowers are blocked in with mixtures of Cadmium Orange + Cadmium Yellow Medium + MUD, Cadmium Yellow Medium + MUD and pure Cadmium Yellow Medium. I guess “Southwesternizing” is a word! We’ll get to doing that in a minute, first we have to lay the tile on the courtyard floor. 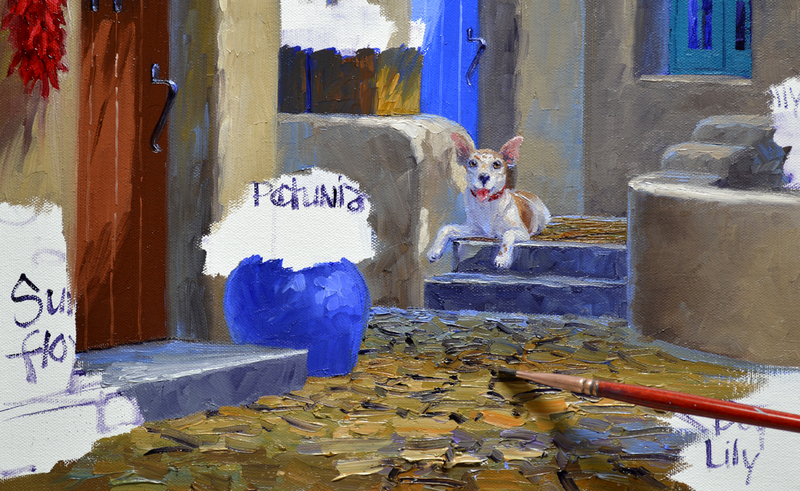 To begin, the entire surface is covered with several combinations of MUD (Ultramarine Blue + Alizarin Crimson) + Cadmium Orange + White. In this step I want to establish the light and dark pattern on the tiles. A few strokes of the darker red from the gate are made into the shadow area of the floor. This gives the impression the tiles are a little wet and the gate is reflecting down into them. The lines separating the individual tiles are drawn freehand into the wet paint of the floor with a fine liner brush. I can’t use the mahl stick to do this, it would limit the movement of my hand and arm, preventing me from making straight lines. The trickiest part of the floor is figuring out how the lines should go when they extend over the edge of the canvas on to the sides! 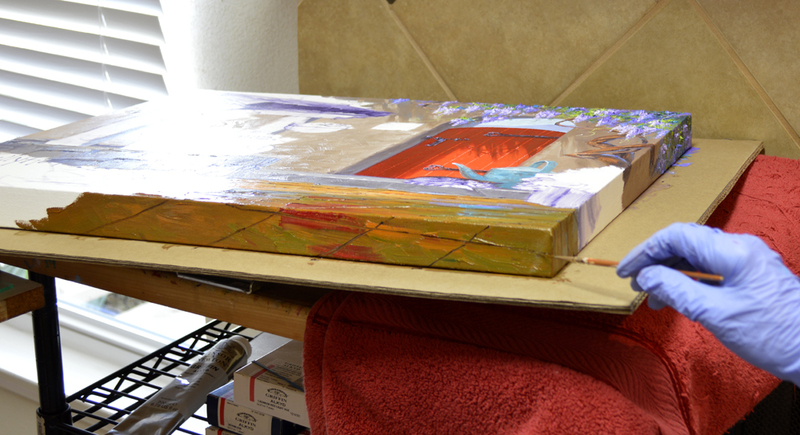 Having the painting attached to a piece of cardboard makes it easy to take off the easel and lay flat in order to work on the bottom edge. To see how the canvas was mounted to the cardboard CLICK HERE. A cheery sun face tile is mounted on the wall by the gate. You may click on the this image, or any of the others, to see them larger. The mixes for the terra cotta containers and tile roof are as follows: #1. MUD + Cadmium Red Light + a little Cadmium Orange + White. #2. MUD + Cadmium Red Light + a bit of Cadmium Orange. #3. Mostly MUD + a little Cadmium Red Light + a hint of Cadmium Orange. After being covered initially with mix #2 the hanging container is highlighted with mix #1. 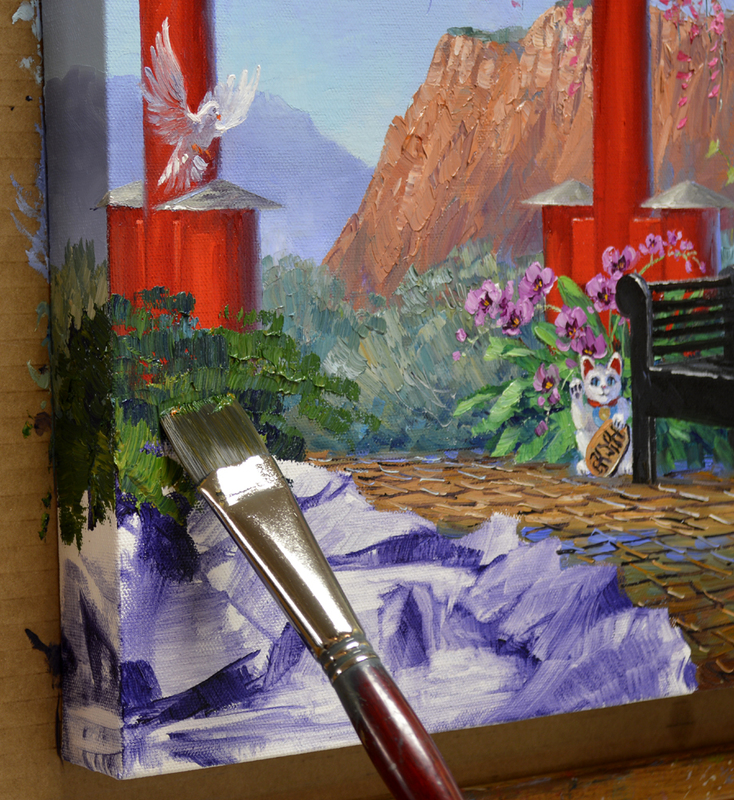 The edge on the right side of the container, opposite the sun, is rimmed with a stroke of Ultramarine Blue + White. This helps to give the hanging pot the appearance of roundness. 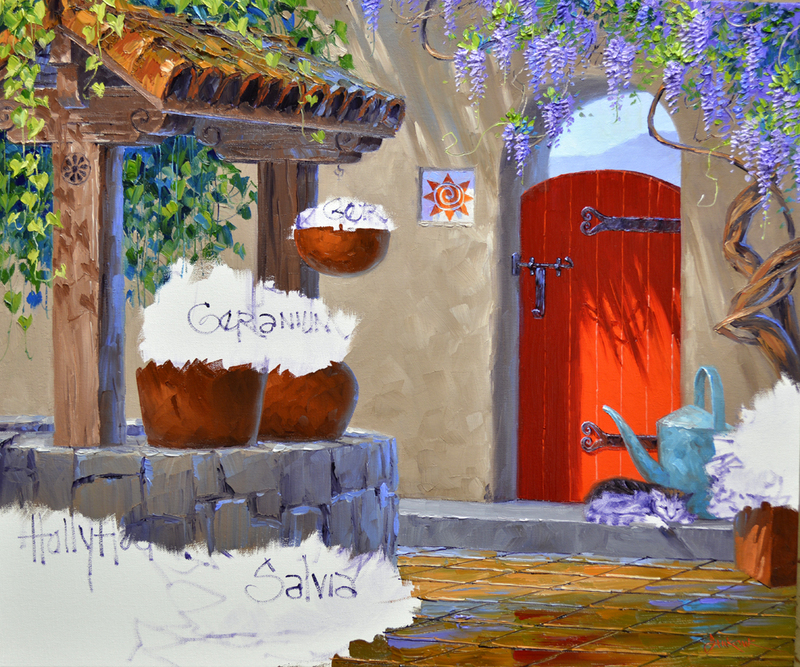 Now let’s give that old water well a Santa Fe touch. Southwestern motifs are carved into the rough beams and corbels supporting the roof. VIDEO! Painting the tile roof of the old water well! The same mixtures used on the terra cotta containers make the tiles of the roof. 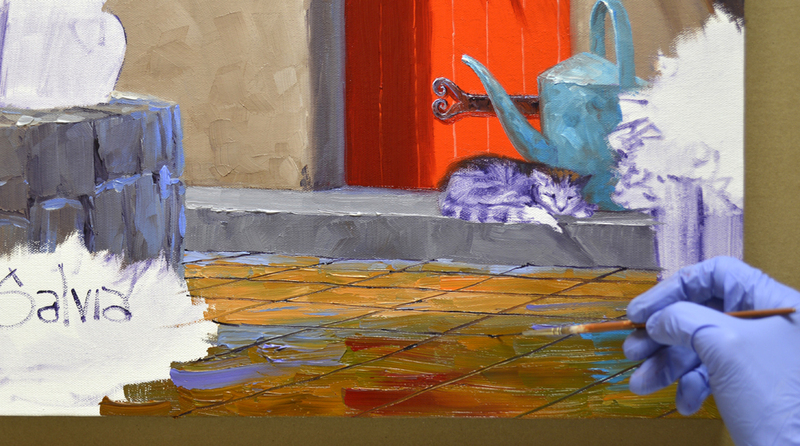 Brushstrokes of Ultramarine Blue + White are adding on the tiles at the back edge to make them recede. Heart shaped shadows from the vine cascade down the weathered support beams. 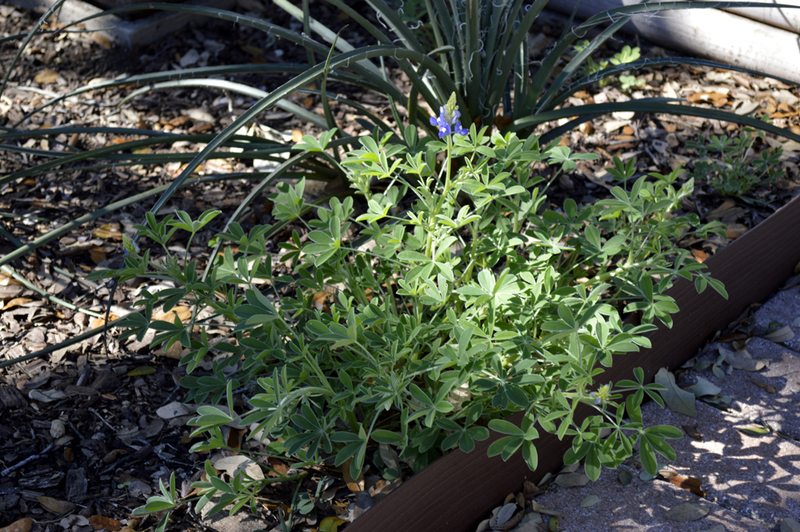 My bluebonnets are beginning to bloom! Spring, Jack’s and my favorite time of year, is springing. There is nothing like watching the garden wake up after a winter’s nap. Now to the garden on my canvas. The base of the old water well is made of large stones. 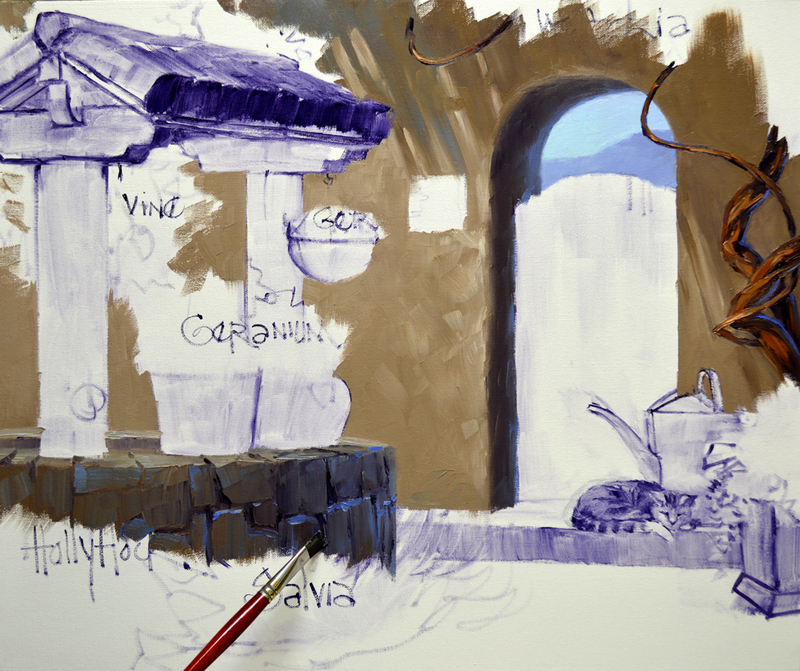 Mixes of Ultramarine Blue + Cadmium Orange + MUD (Ultramarine Blue + Alizarin Crimson) + White are used for the weathered rock. 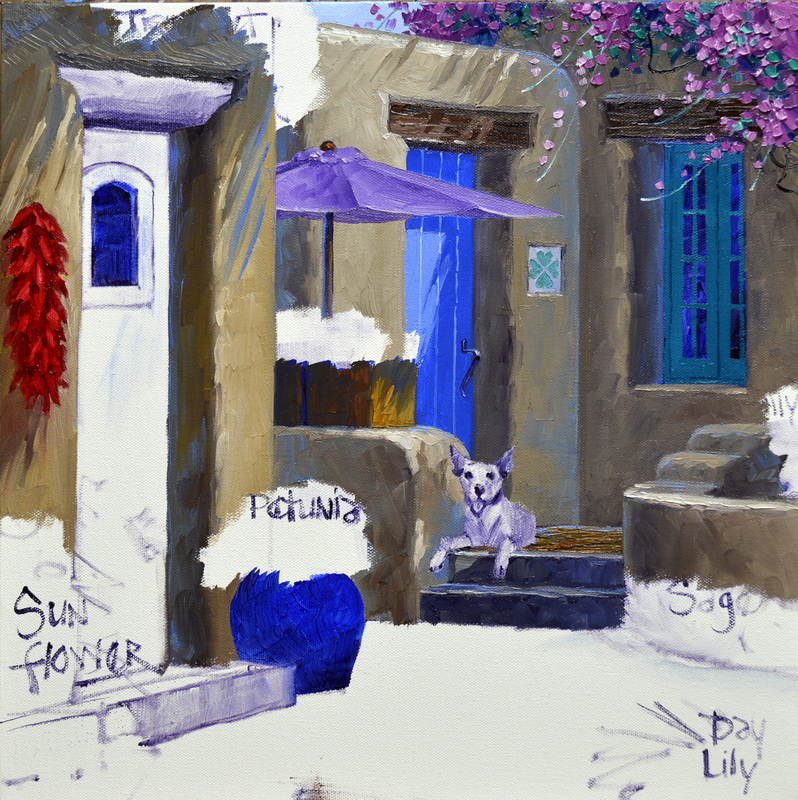 If you’d like to learn more about our Double Primary Color Mixing System that Jack developed CLICK HERE. 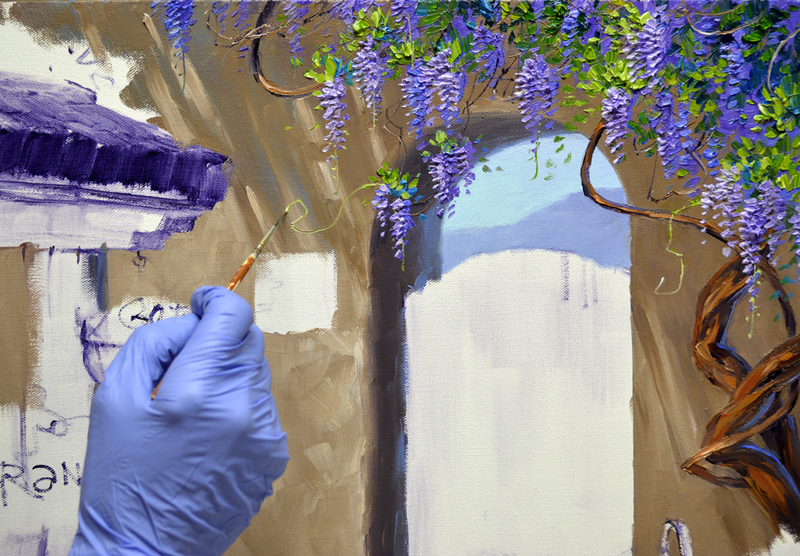 Combinations of Dioxazine Purple + Ultramarine Blue + White are used to block in the blossoms of the Wisteria. Dioxazine Purple is a beautiful color that is perfect for the long, dangling flowers. Next the soft leaves are painted. The greens are worked around the masses of purple, helping to shape the blooms. After the delicate petals of the blossoms are highlighted, long vine-like tendrils are drawn across the wet adobe wall. Please remember as you read through my blog, you may click on any of the images to see them larger. Old watering cans have always fascinated me. It seems the more beat up and dented they are, the more I like them! We saw these heart shaped hinges on a gate in Provence, but they certainly work equally as well on this red gate in Santa Fe. First of all, I’m safe and sound. 4 tornadoes touched down in San Antonio last night, but far from where I am. Got lots of crazy wind and 2 3/4 inches of rain. Now Molly and Sissie, our rescue kitties, hated it. Molly was howling louder than the storm! After the worst had passed through and I finally got back to sleep those two decided to play chase on the bed. On top of me, of course. KIDS!!!! Had plenty of small branches and ball moss to pick up in the yard this morning, but other than that I was certainly blessed. Please keep those who were less fortunate than me in your prayers. 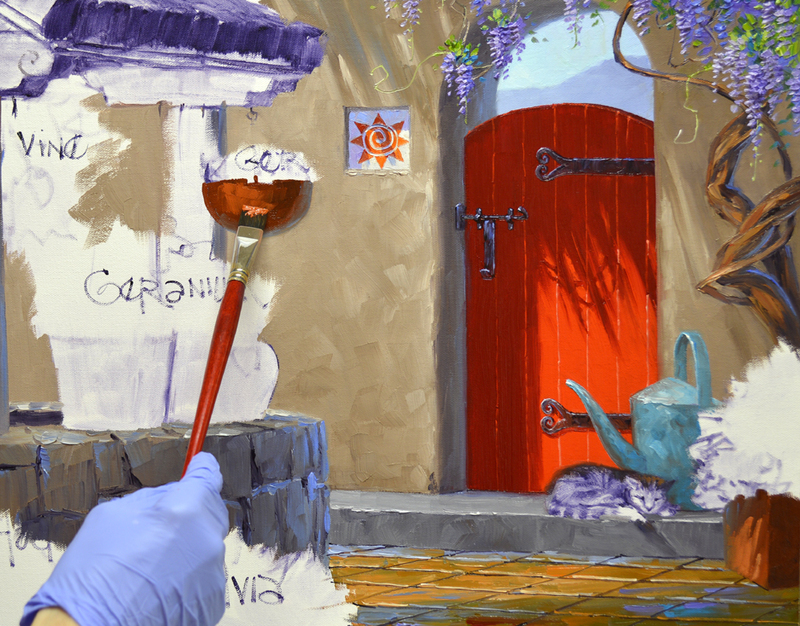 So, back to painting. 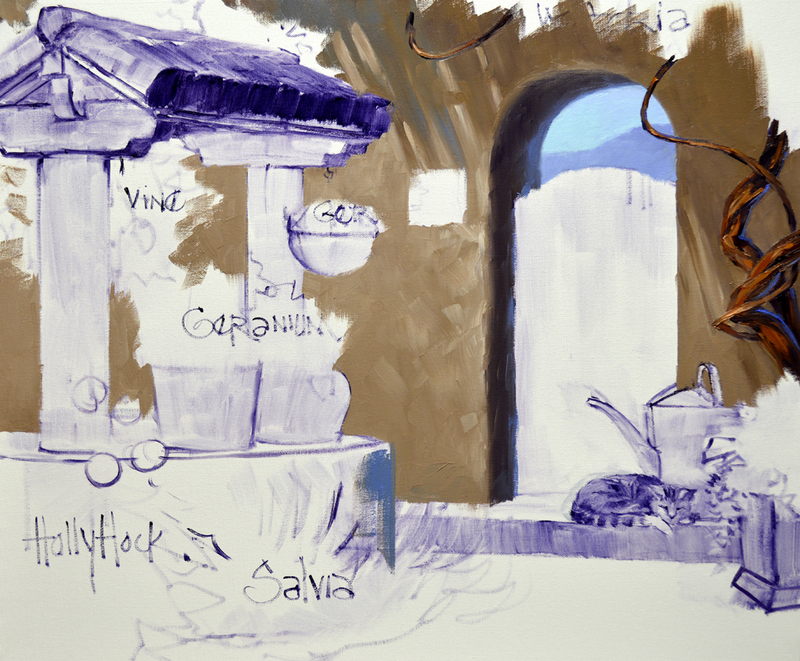 I’m beginning a new piece for our Santa Fe gallery, 20 inches tall by 24 inches wide. I love this old, water well. 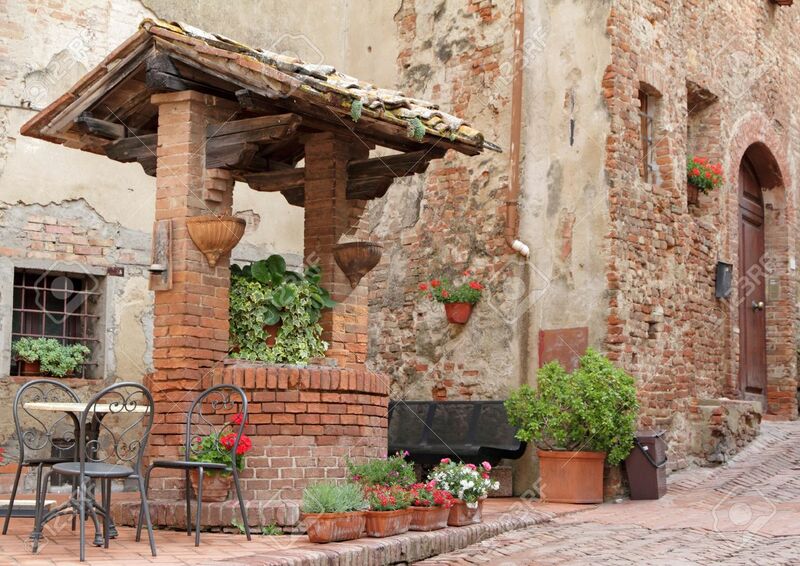 We’re going to magically move it from Tuscany and place it in a typical Southwestern courtyard. 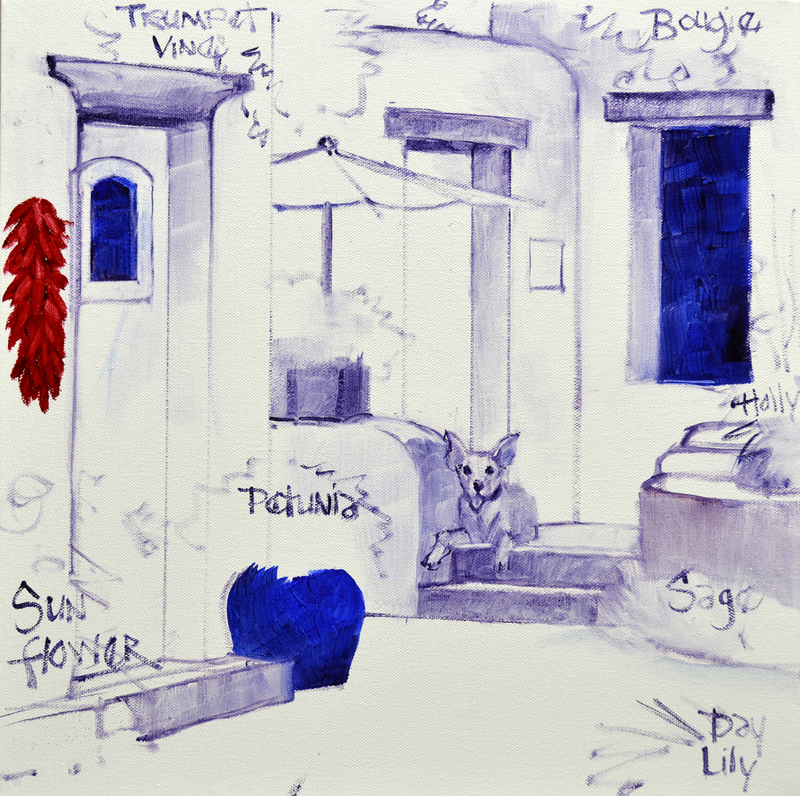 The drawing is sketched on the canvas with a brush dipped in a thin wash of MUD (Ultramarine Blue + Alizarin Crimson) + Liquin Original. I make sure to add plenty of Liquin to the wash, that way it will flow smoothly and won’t clump. 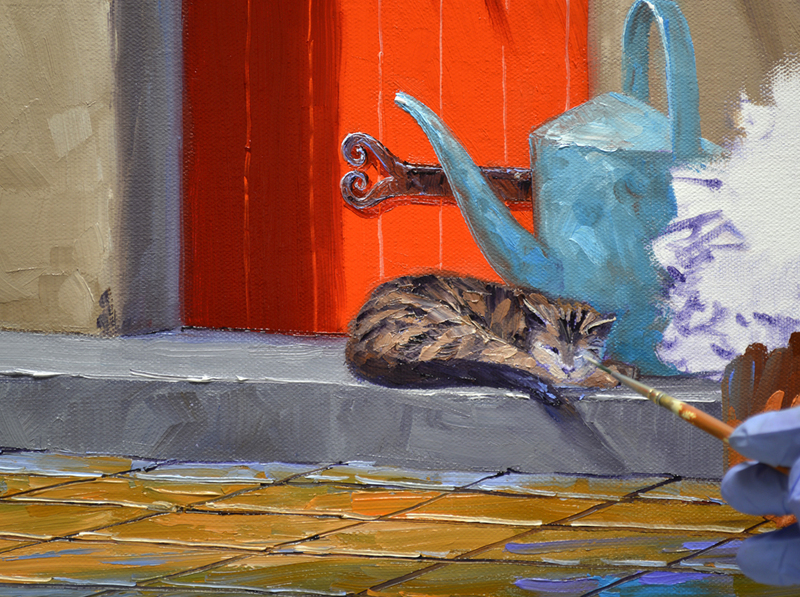 A kitty, snuggled up against an old watering can, sleeps on the step up to the gate. We catch a glimpse of the surrounding mountains through the opening over the gate. Then construction of the courtyard wall begins. 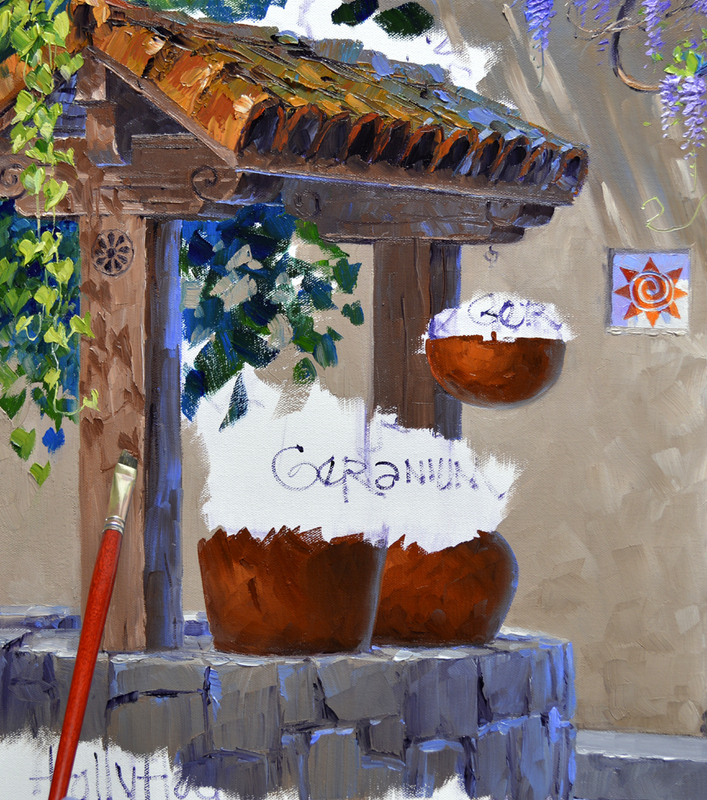 Several mixes of Cadmium Orange + Ultramarine Blue + MUD + White are used for the adobe. 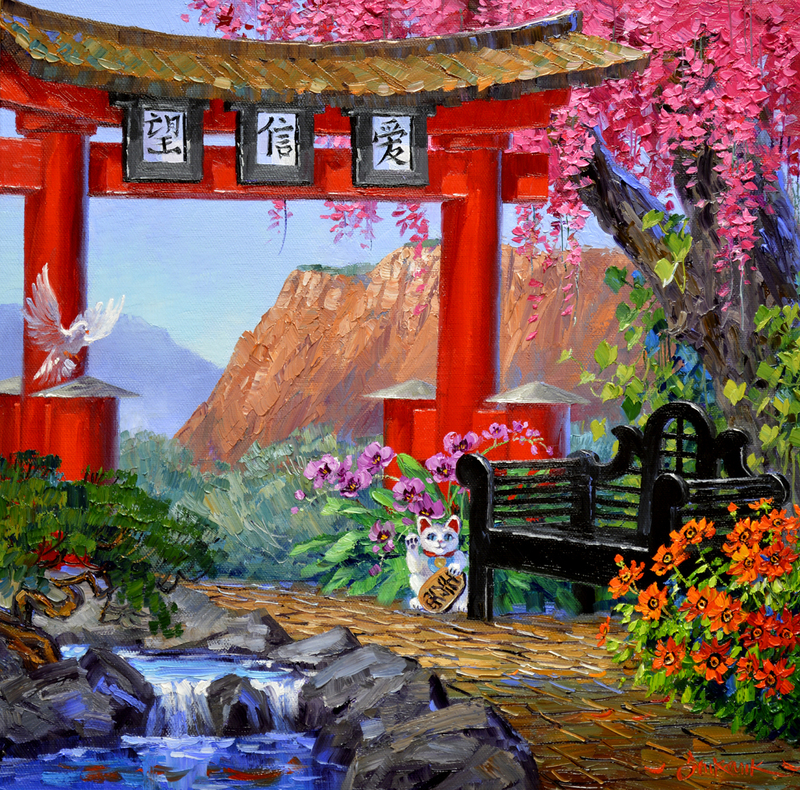 A Wisteria will guard the gate. It’s fun painting the gnarly, twisted trunk. 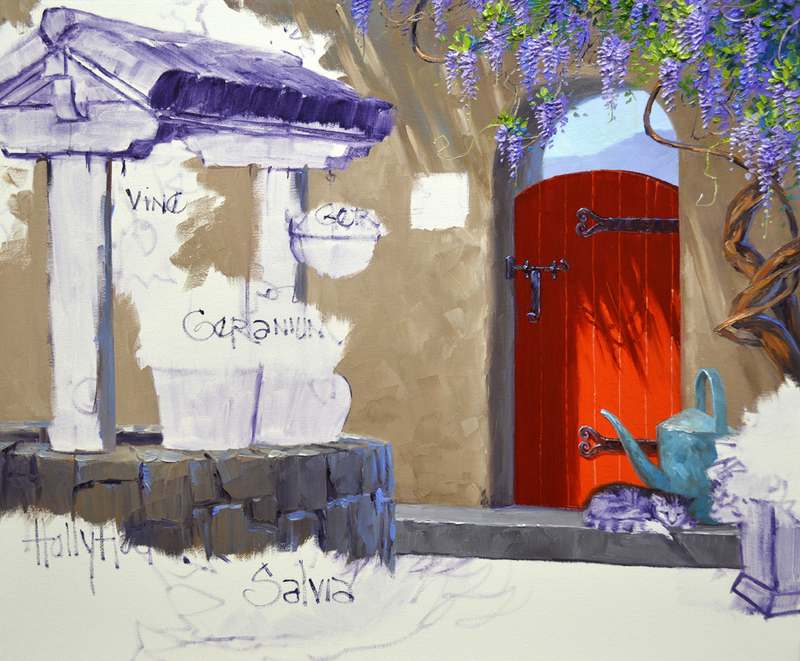 The purple blossoms and soft foliage will be added in our next session. If you would like to receive an email every time I publish a new post please feel free to subscribe to my blog. CLICK THIS LINK and scroll to the upper right side of the page. You will see a heading EMAIL SUBSCRIPTIONS. Just enter your email address and click the button “Sign me up!” It’s easy. And if you enjoy my blog please CLICK the FaceBook LIKE Button. As we say in Texas, “Much Obliged! What would a Santa Fe alley be without a strand of chili peppers? The initial wash in is totally dry, now I come back and paint the rista with thick brushstrokes. 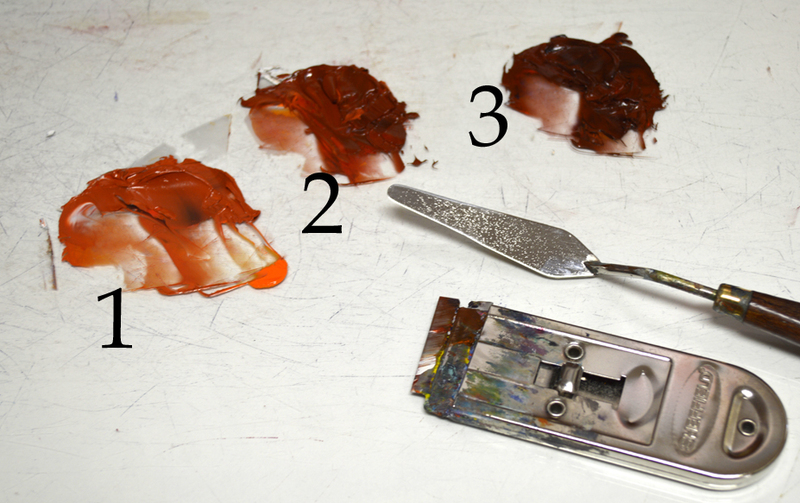 Mixes of Alizarin Crimson + White are used to delineate the individual peppers. Geraniums fill the containers on top of the wall by Looka. They’ve been blocked in with my usual sequence of FLOWERS FIRST, LEAVES LAST. 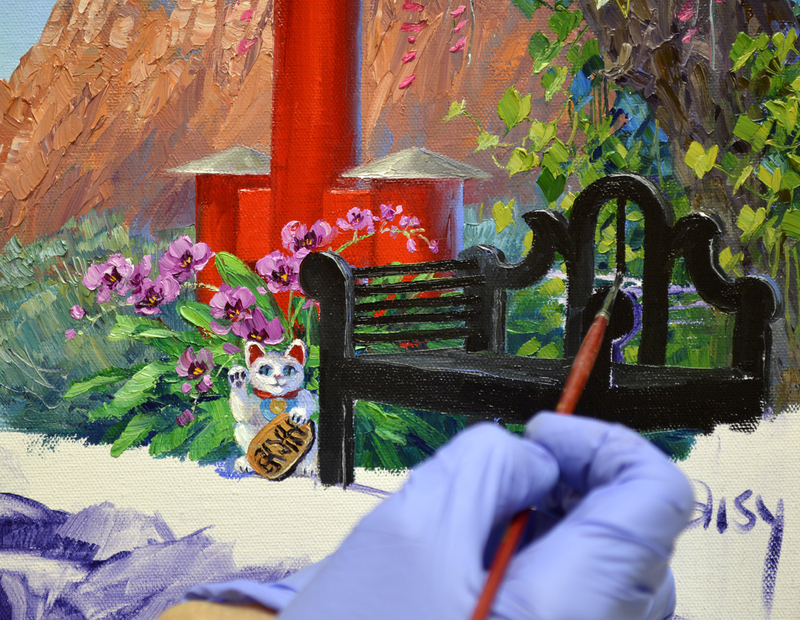 Then the petals illuminated by the sun are highlighted with a combination of Cadmium Red Light + White. Mr. Chippers decided to drop in for a visit. Can’t you just hear his cheerful chip, chip, chip? Bet in Cardinal talk he’s saying HI to Looka. He reminds me of the Lone Ranger with his black mask! If you’d like to enlarge the image just click on the picture. 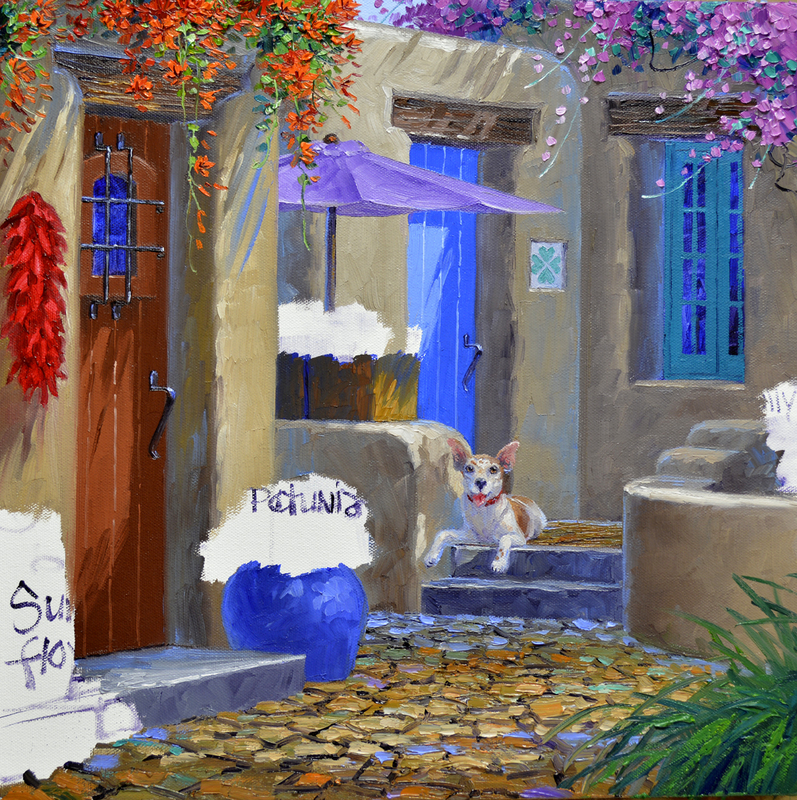 Magenta Hollyhocks extend around the corner of the canvas. 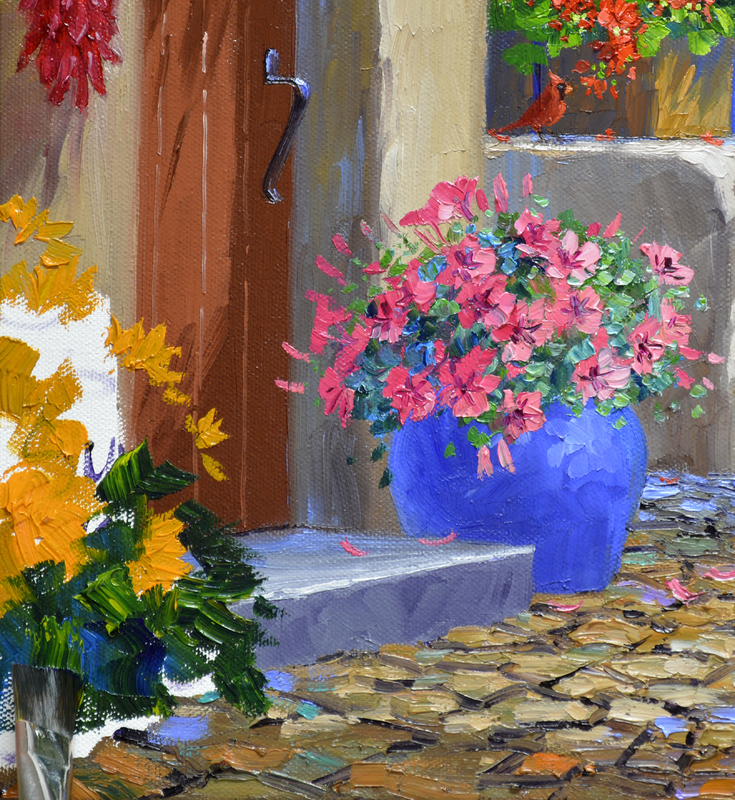 The flowers are made of various mixes of Magenta + White while the foliage is combinations of Ultramarine Blue + Lemon Yellow. After planting pink Petunias in the container by the door I begin on the Sunflowers. 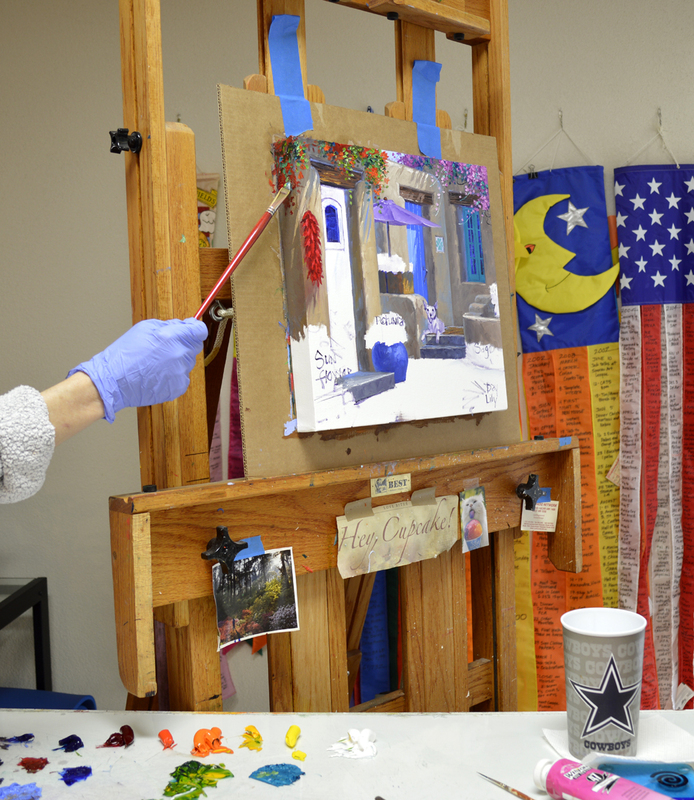 Mixes of Cadmium Yellow Medium + MUD (Ultramarine Blue + Alizarin Crimson) and pure Cadmium Yellow Medium are used to block in the large blossoms. 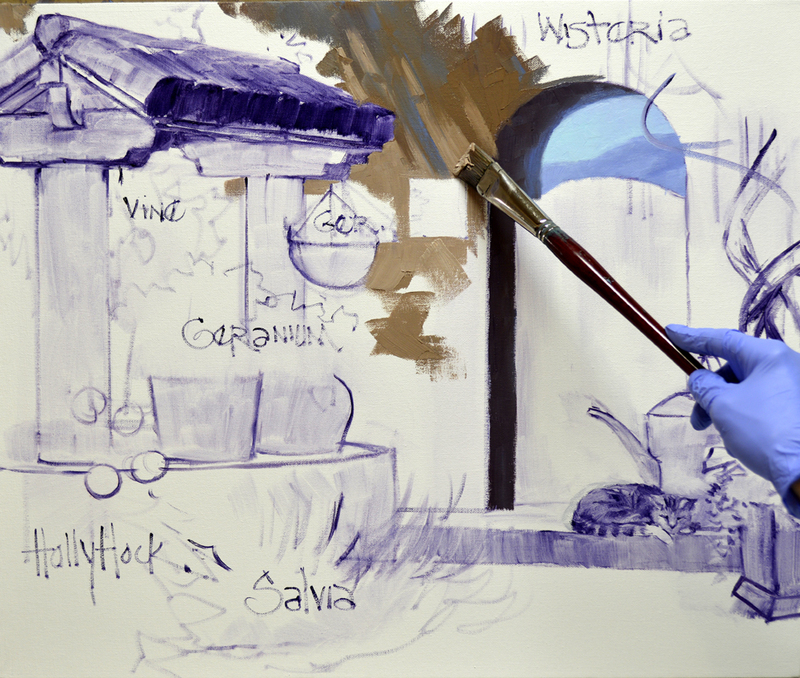 A little Cadmium Yellow Medium is mixed into the greens that remain from the Hollyhocks. The leaf color is worked around the masses of yellow, helping to shape the blooms. Adding the dark centers with a mixture of MUD + Liquin makes the Sunflowers immediately identifiable! 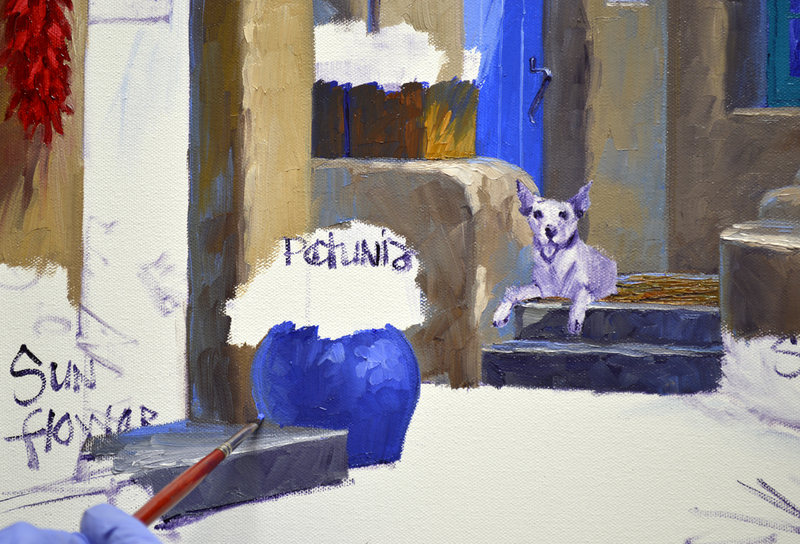 The Blue ceramic pot is blocked in with mixes of Ultramarine Blue + White. 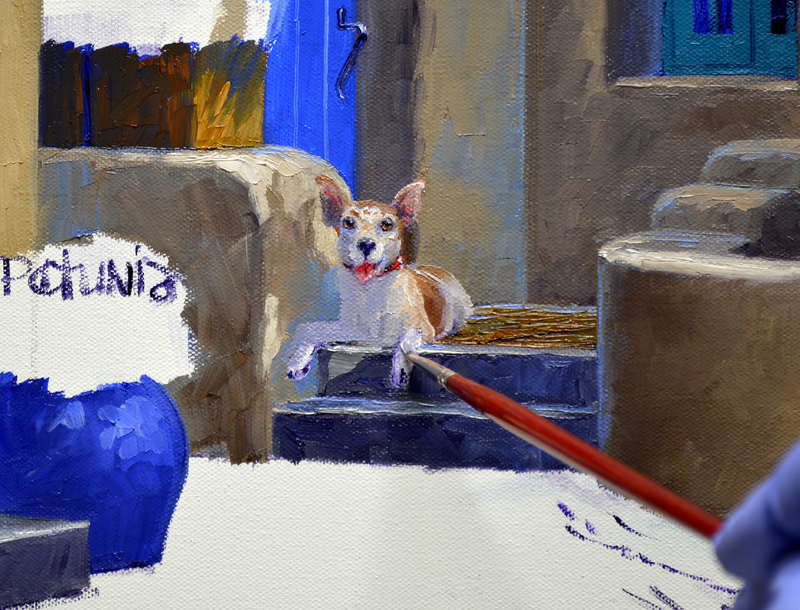 A little MUD (Ultramarine Blue + Alizarin Crimson) is added for the darkest value. The back edge of the container is rimmed with a stroke of a lighter Ultramarine Blue + White mix. This helps to give the feeling that the pot is round. Red Orange Trumpet vine drapes down over the building in the foreground. 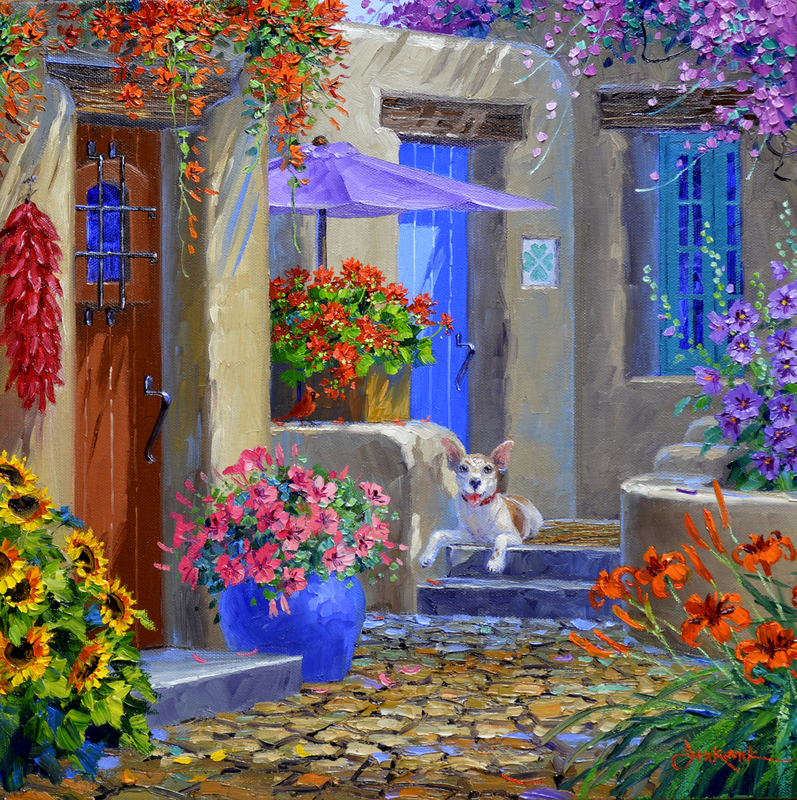 The warmth of these flowers makes the cooler ones of the Bougainvillea drop back. 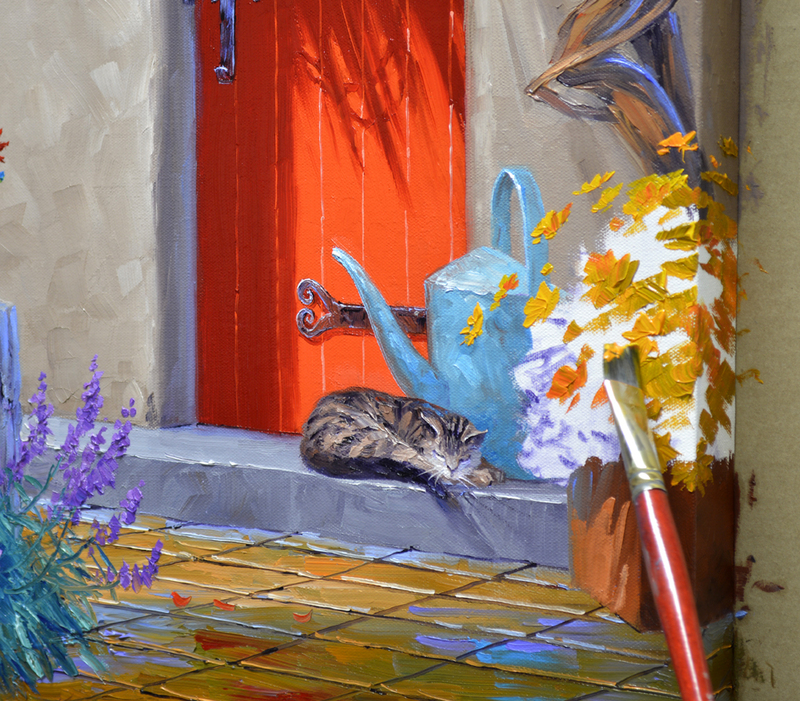 Mixes of MUD + Cadmium Orange + Cadmium Red Light + White are used for the mahogany “Speak Easy” door. 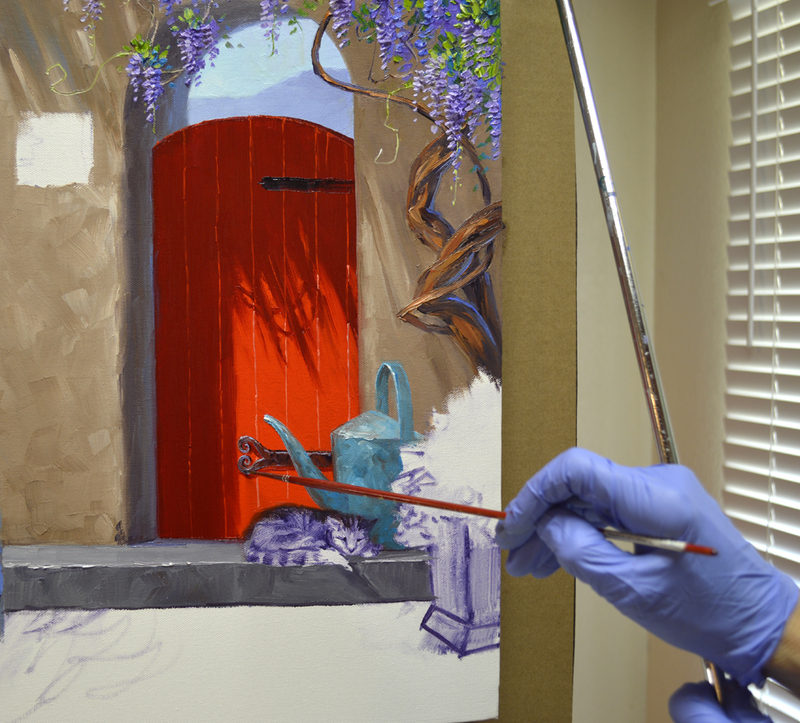 Extra White is added to the mixture for the sunlit portion of the door. 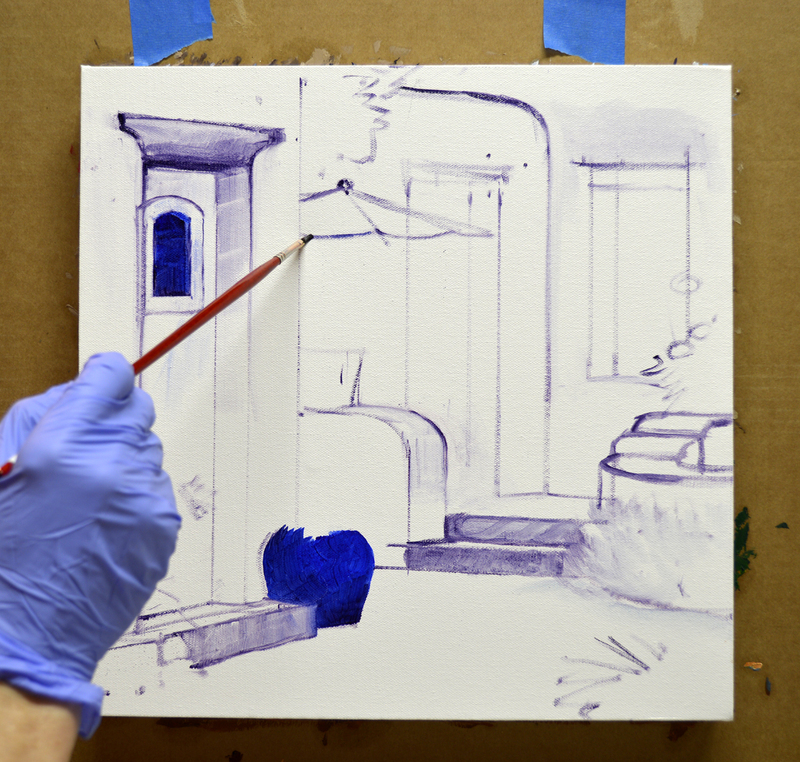 When I originally sketched up my drawing on the canvas I covered the window area with a thin wash of MUD + Liquin and Ultramarine Blue + Liquin. It’s completely dry now so I’m able to draw the wrought iron rails over the “Glass”. 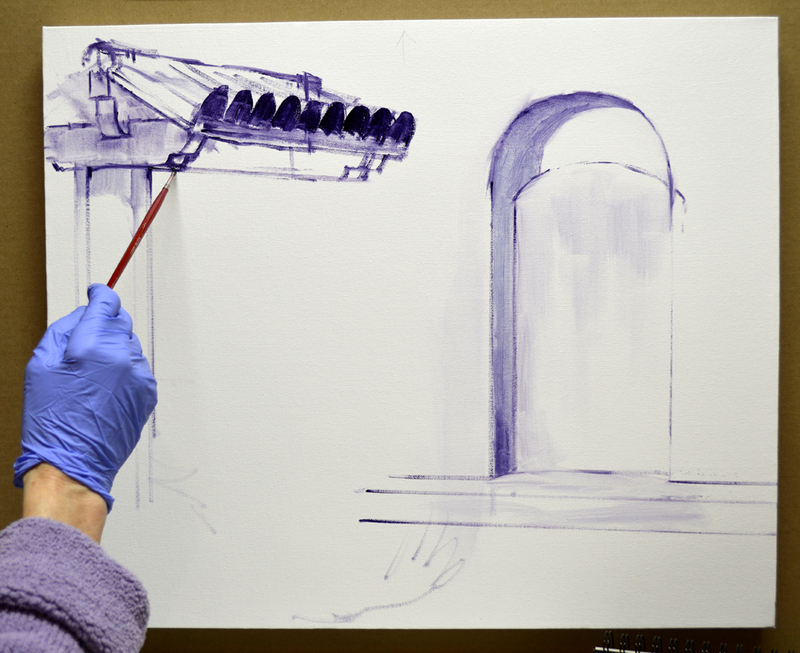 My hand is resting on the mahl stick to keep it steady as I delineate the straight bars. Looka is a cutie! I love his ears and bright eyes. Even though he has a bright White spot on his forehead the rest of his coat is not totally white. 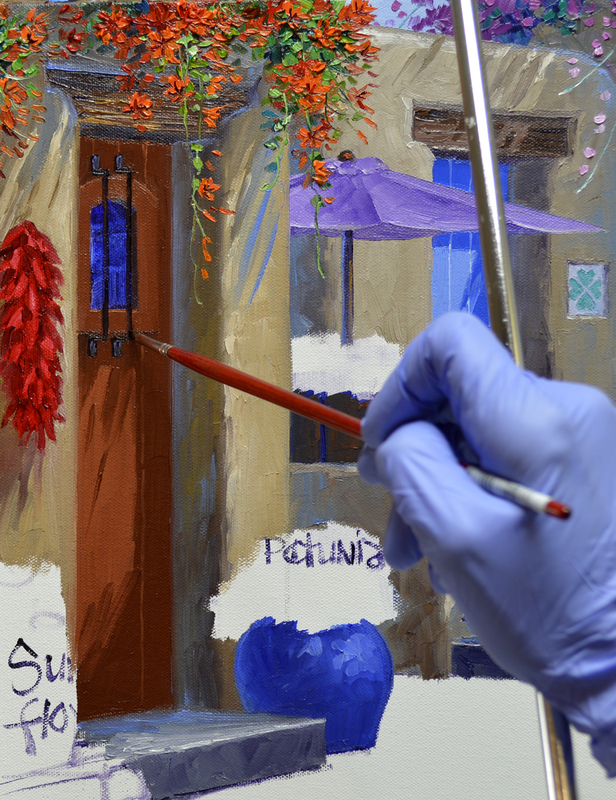 So I’ve made a creamy mixture by combining White + a bit of Cadmium Orange + a touch of Ultramarine Blue. MUD is added to the mix for the shadows. His brown spots are made from paint left from the Terra Cotta containers. Please remember as you go through my blog, you may click on any of the pictures to see them larger. The cobblestone area is first painted with the light and shadow pattern, then I come back and indicate the crevices between the rocks. I don’t want to outline each and every one, but rather give the impression of the cobbles. If you look at a cobblestone street in real life you don’t see all of the cracks, just dark indentations here and there. 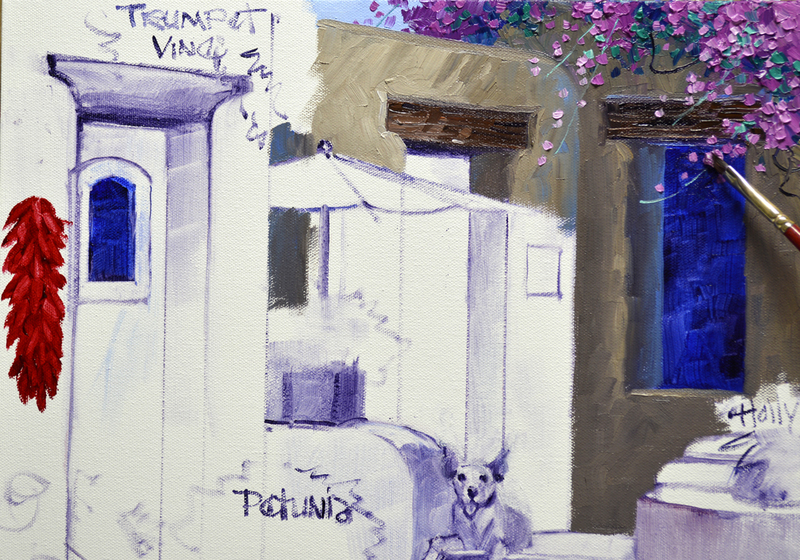 The Bougainvillea cascading over the adobe building is painted with several different mixtures of Magenta + White. The leaves are made of various shades of Viridian Green + White. One of the neat things about being an artist is we can make the world as we want it to be. There is no way “Bogies” would survive the Santa Fe winters. But in this painting it NEVER gets cold! Jeana requested a touch of the Irish in this piece, so a shamrock with heart-shaped leaves resides on a tile by the door. 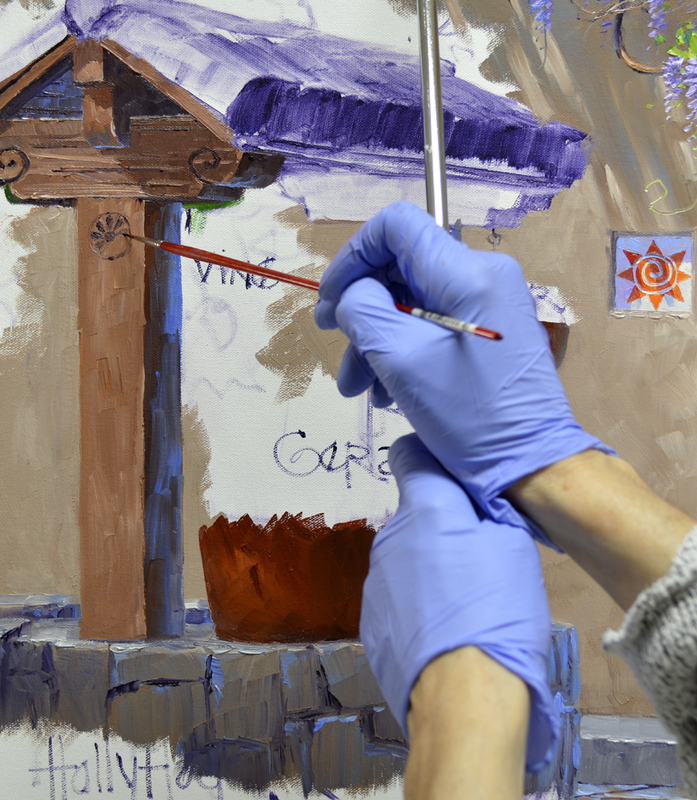 My wrist is braced against my mahl stick to steady my hand as I paint the details. This also alleviates any strain on my shoulder. Painting full-time I have to be careful of my joints and muscles. Can’t allow them to get inflamed and sore. Sunlight streams into the alleyway from the upper right. Looka casts a neat shadow on the wall of the entry porch. 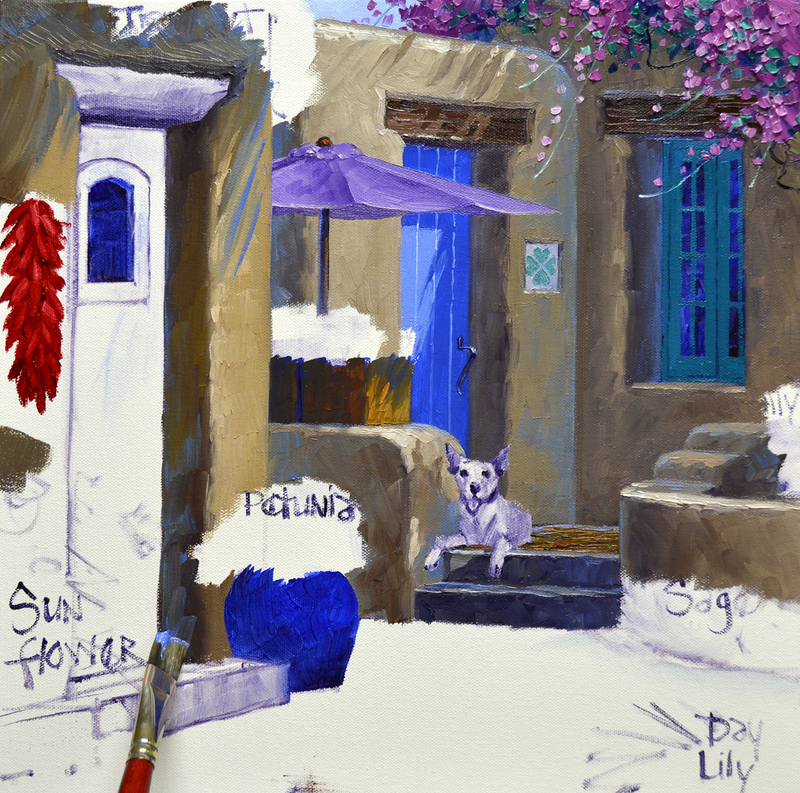 A Dioxazine Purple umbrella compliments the Cobalt Blue door and Turquoise window. The wall of the door jamb is in shadow. 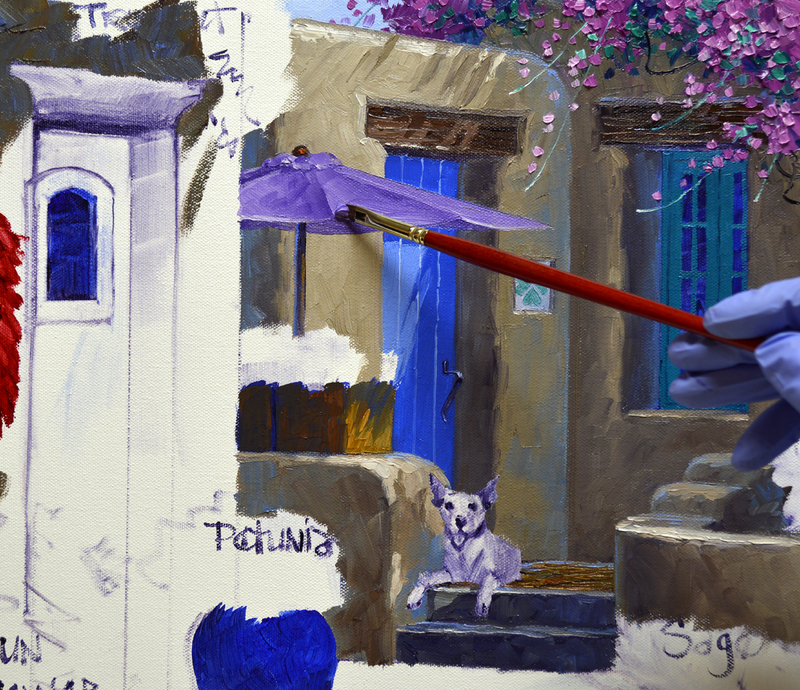 A little bit of Ultramarine Blue + White is added to the edge closest to the door to make it recede. Our construction phase of the adobe structures is complete. 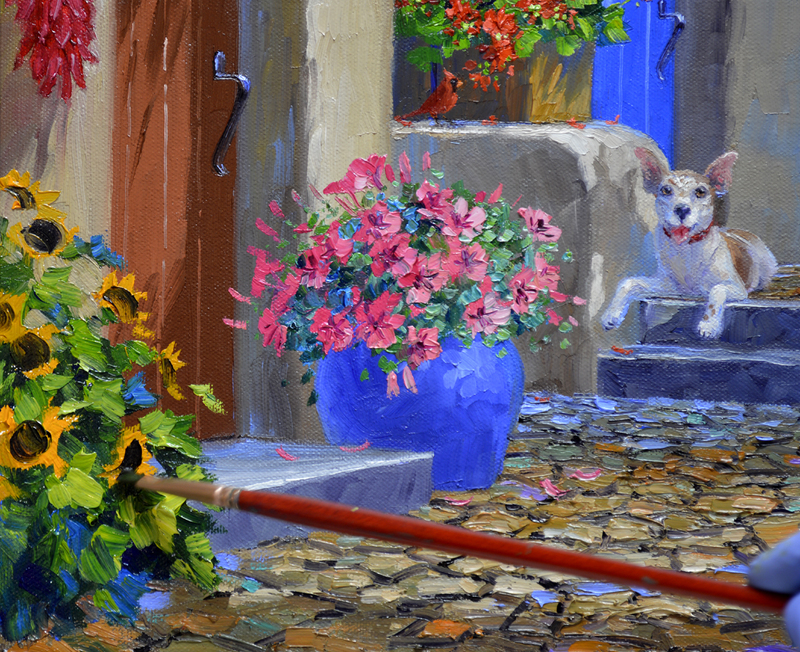 I’ll be working on the “Speak-easy” door and Looka in our next session. Hope you’ll come join me! But before I go I’d like to thank you for all of the warm messages everyone sent me for Valentines. I certainly hope yours was wonderful. My day got off to a special start. Valentines’ morning, as I began my walk, the skies were covered in clouds. We had gotten two inches of rain during the night. 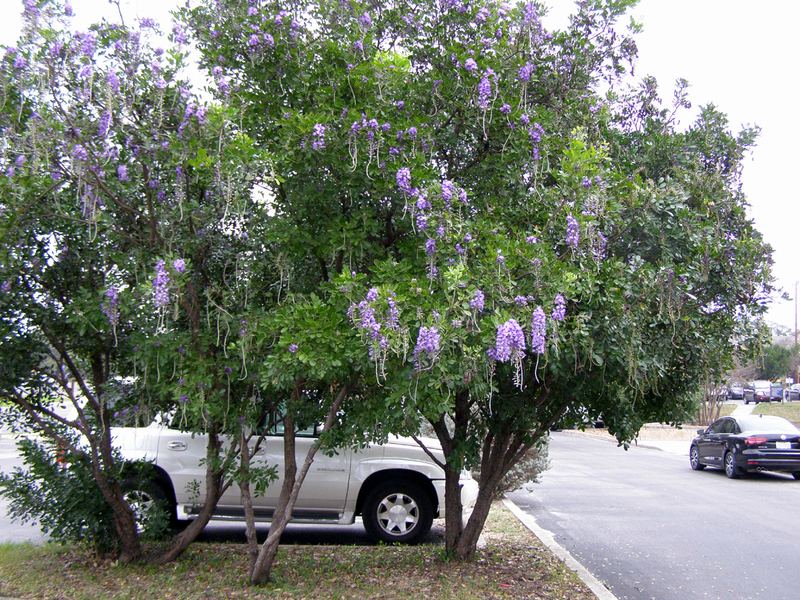 At the end of our street there are some beautiful mountain laurel trees that are in full bloom right now. 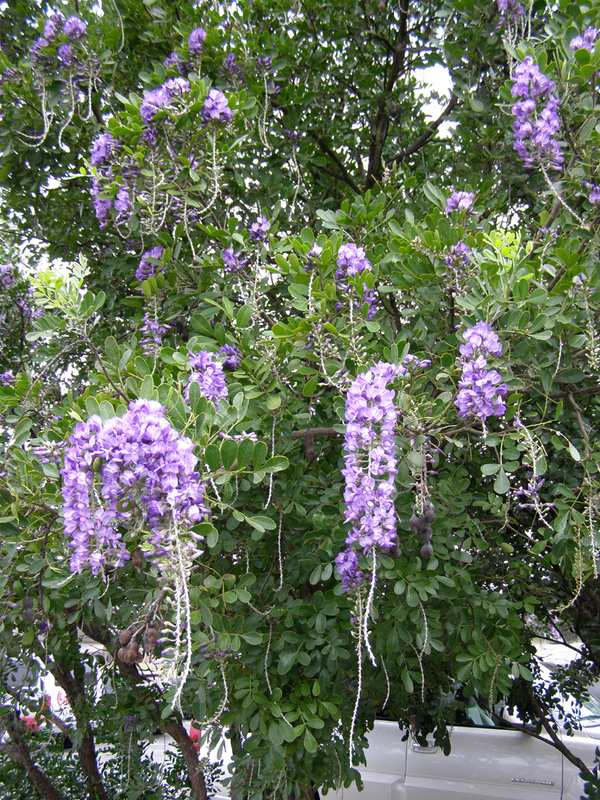 You can see how pretty these Texas tress are in the picture above. You may click on the image to see it larger. The blossoms smell heavenly. I wish I could somehow capture that fragrance in my blog. Well….just as I got there, taking in that amazing aroma, the sun broke through the clouds. You could see some blue sky and part of a sunlit cloud through the window to Heaven. 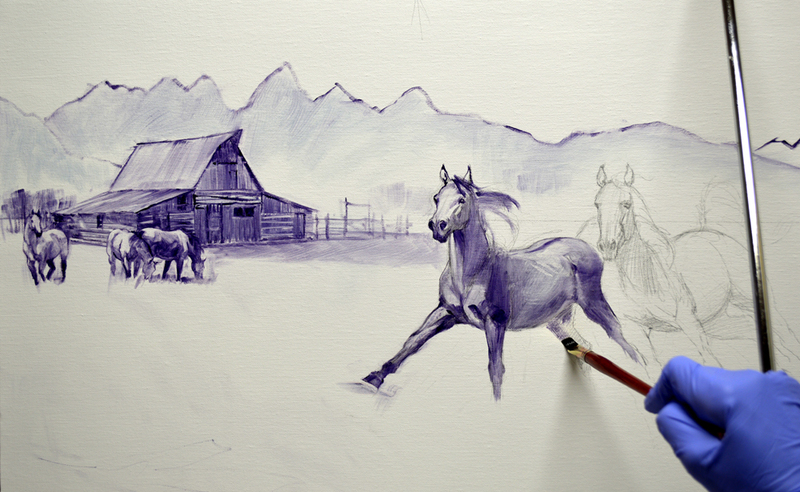 I’m beginning on another piece for Jeana. 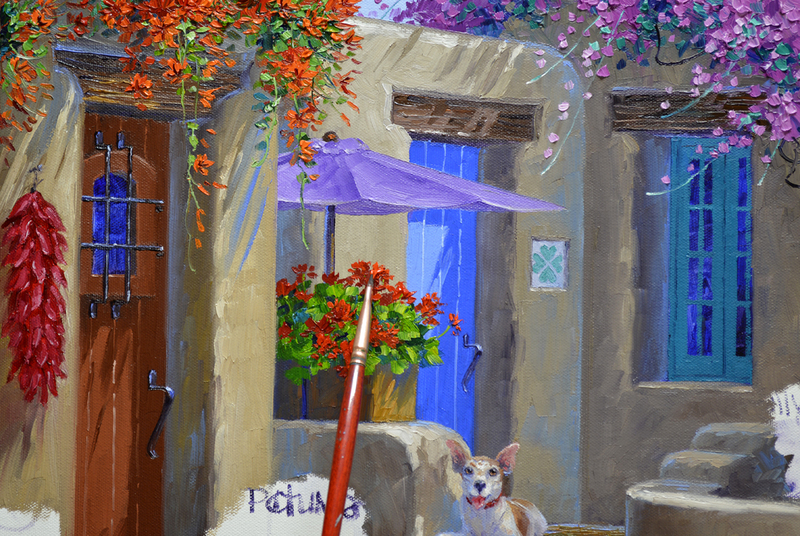 This one takes us back to a cozy little alley in Santa Fe. She wanted to incorporate one of her fur babies, Looka. Here’s my pen and ink sketch. 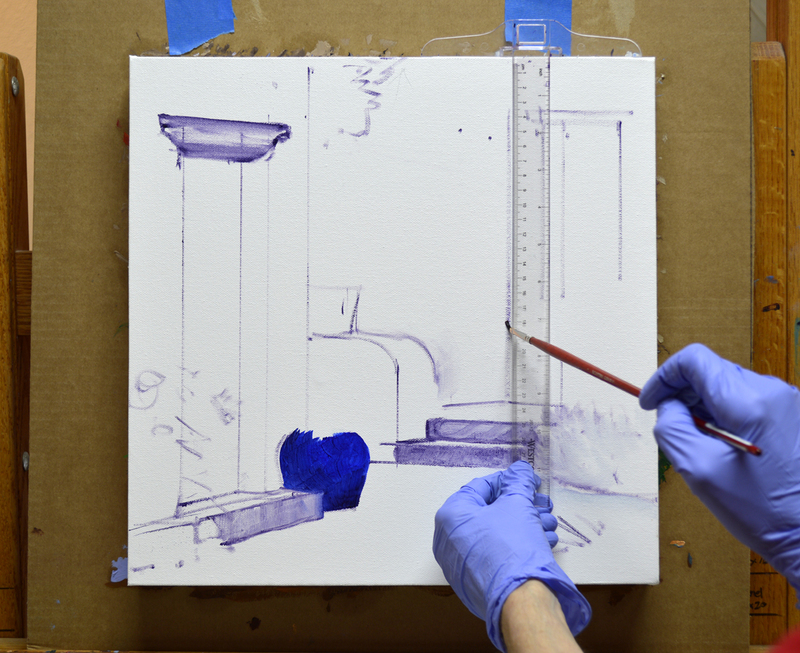 First, the basic architecture is drawn up on the canvas with a brush dipped in a thin wash made of MUD (Ultramarine Blue + Alizarin Crimson) + Liquin Original. A T-Square, resting on the top of the canvas, is used to insure my lines are straight up and down. 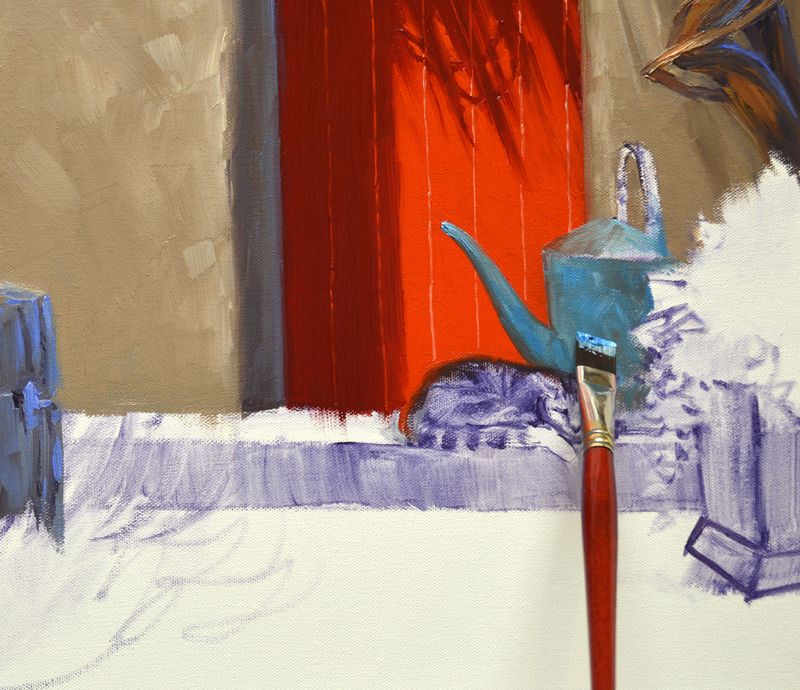 The container by the door is washed in with Ultramarine Blue + Liquin Original. The top of the open umbrella is sketched before drawing in the pole. Looka happily rests on the top step, watching the world go by. First, I’d like to thank all of you for the advice on how to recover the files “That Molly” deleted. Armed with the knowledge I’m ready for the next time it happens. 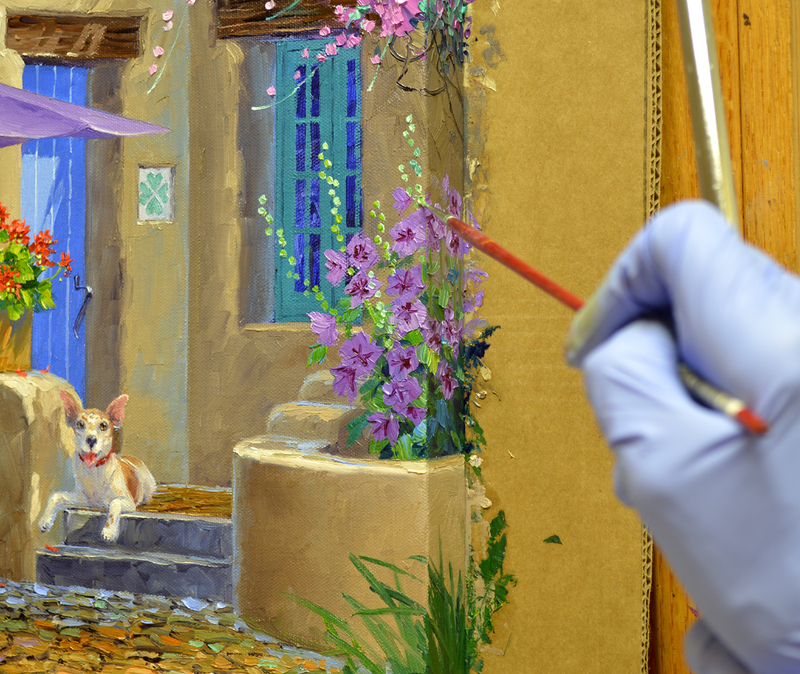 I decided this time to just move ahead with our painting. The black lacquer bench is painted with mixes of Ivory Black + White. 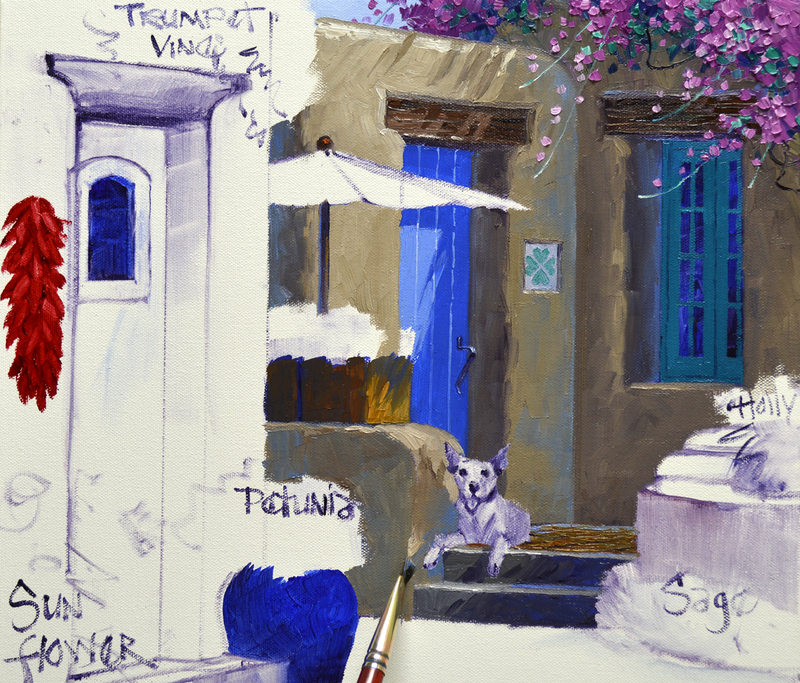 Also a few highlights are added with a mixture of White + Ultramarine Blue. 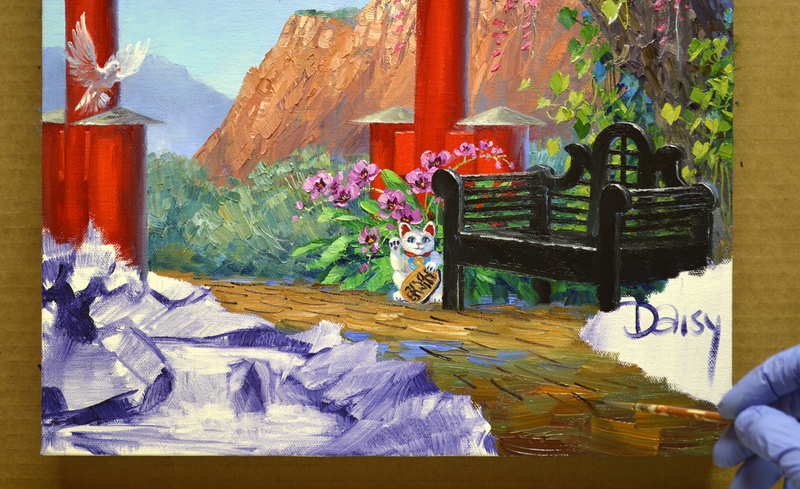 All of the foliage behind the bench was painted first, now the rails are drawn over the wet background. The curved walk is made of rough pavers. The entire surface was first covered with heavy brushwork, establishing the light and dark areas. 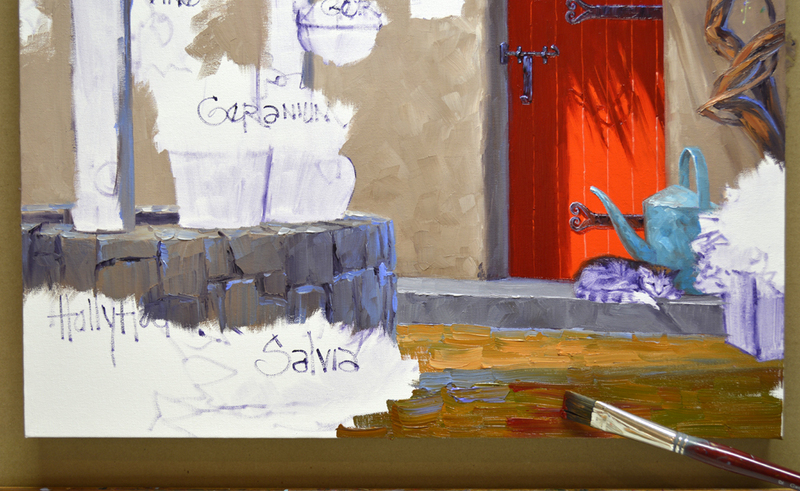 Irregular, curved perspective lines are pulled into the thick paint with a fine liner brush dipped in a mix of MUD (Ultramarine Blue + Alizarin Crimson) + Liquin. 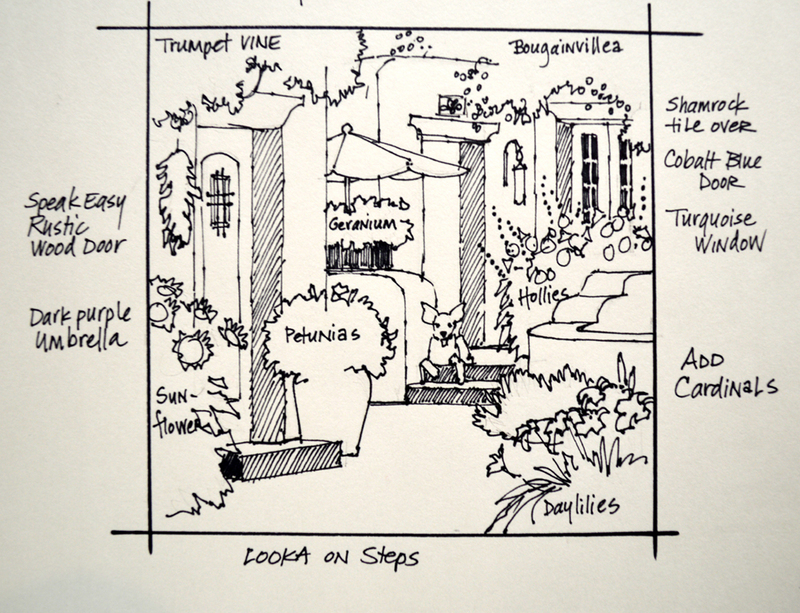 When those are complete the horizontal crevices, separating the individual pavers, will be drawn with the same brush. 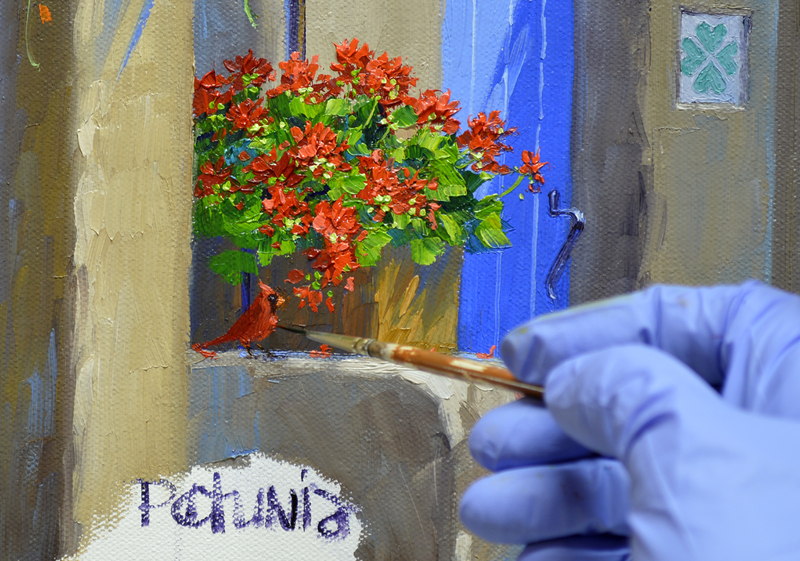 The needles of the Bonsai Tree are painted with combinations in varying proportions of Ultramarine Blue + Lemon Yellow + a tiny bit of Cadmium Orange. A small waterfall happily cascades over the rocks below the twisted trunk of the Bonsai. 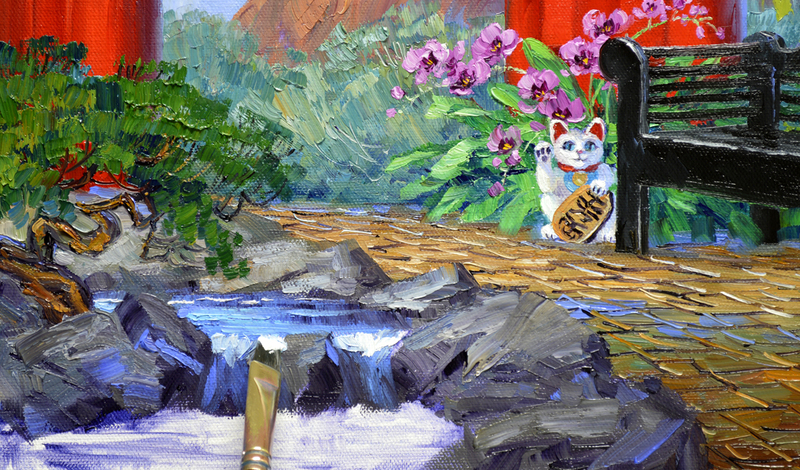 The “Edge” where the water drops from the upper stream over the falls catches light, so it’s accented with White + the littlest bit of Ultramarine Blue. Jeana loves Koi, so we decided to add some in the pond. They are swimming pretty deep, we just see flashes of orange under the surface of the water. 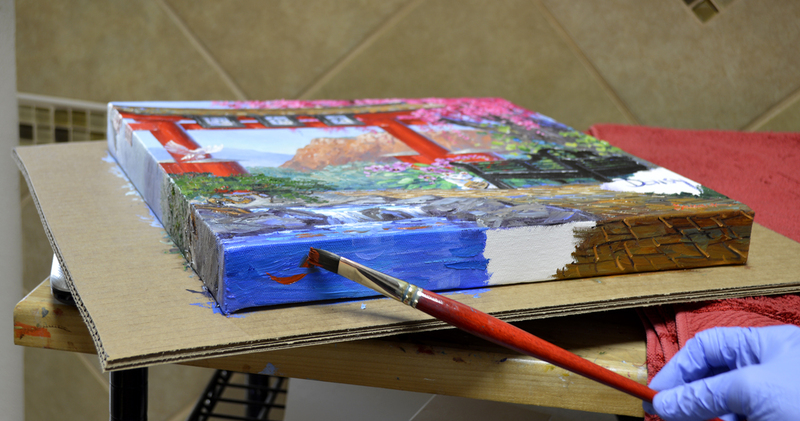 The entire unit, canvas attached to the cardboard backing, is taken off the easel and laid flat. 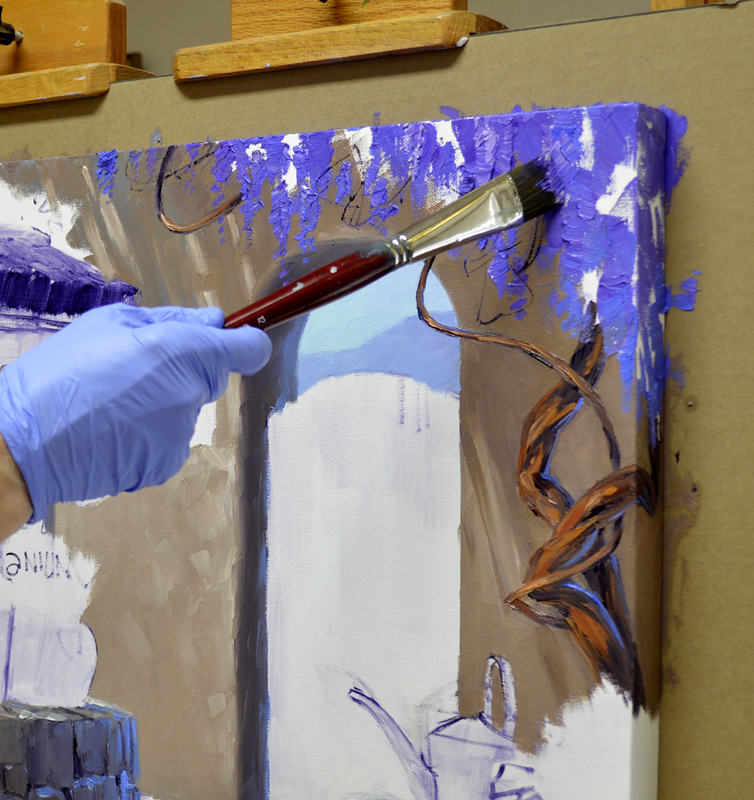 This makes it much easier to paint the bottom edge of the gallery wrap canvas. If you’d like to know how the canvas was attached to the cardboard CLICK HERE.